I’d had a fine meal and couple of pints at the pub the previous evening before making my rather stiff and slow way back to the tent. The skies had cleared into a quite lovely evening and I sat and read for a while with the porch of the tent open. It was cold overnight and I awoke early with a sore back and a deep chill that, even with a shirt and a fleece on in the sleeping bag, seemed to have crept right through me. It was around 5.30 a.m. and, taking a look outside the tent I was greeted with a magnificent dawn view. The sun was hiding behind the hills in the east and a full moon was riding low in the sky to the south. In retrospect, it wasn’t just cold, it was bloody freezing. I’m truly amazed there wasn’t a frost on the ground it was that cold and for once I was glad it was a bit of a walk to the ablutions – it gave me the chance to warm up. I slowly packed things up while getting the stove on the boil for breakfast, and more importantly, something hot to drink. I was also hoping that in the meantime the sun would spread its light onto the tent to dry it off a little, the condensation on it was incredible. Unfortunately, the sun lingered behind the hills and the campsite was still in shadow as I struck the tent, wanting to be on my way. So it was, I eventually hefted the rucksack onto my back (groaning bitterly) and set off to retrace my steps to Newbiggin-on-Lune. It felt heavy, it was heavy and boy, I was glad this was to be the last days walking! This part of the walk was shared with the coast-to-coast for a few miles. 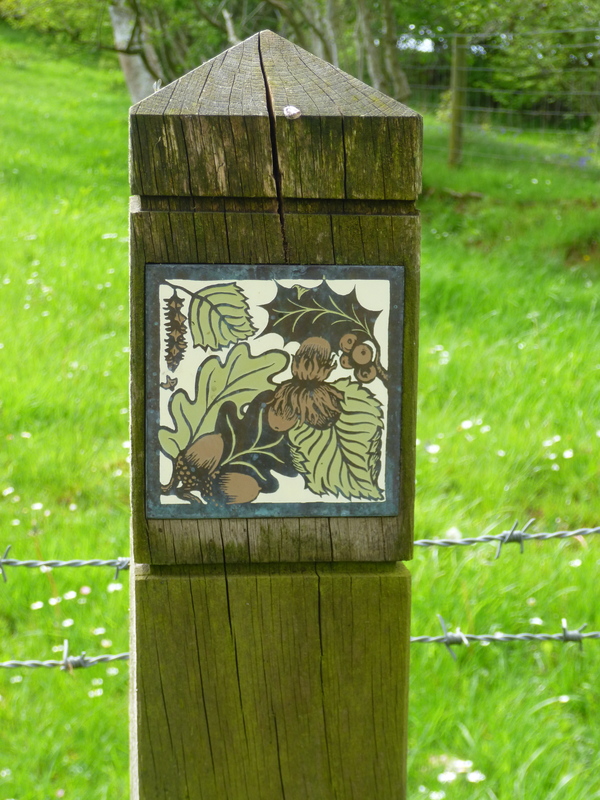 I reached the Great Asby road, crossed a cattle grid and began to enjoy the walking. The sun had finally appeared in full and was warming things up nicely. Although on paper this was a road walk, the road itself was unfenced with a huge grassy area that could be walked on, a boon for my rather sore feet. There were fine views here of the Howgills, their now cloudless tops leaving me muttering to myself about weather forecasts etc. The difference a day makes! 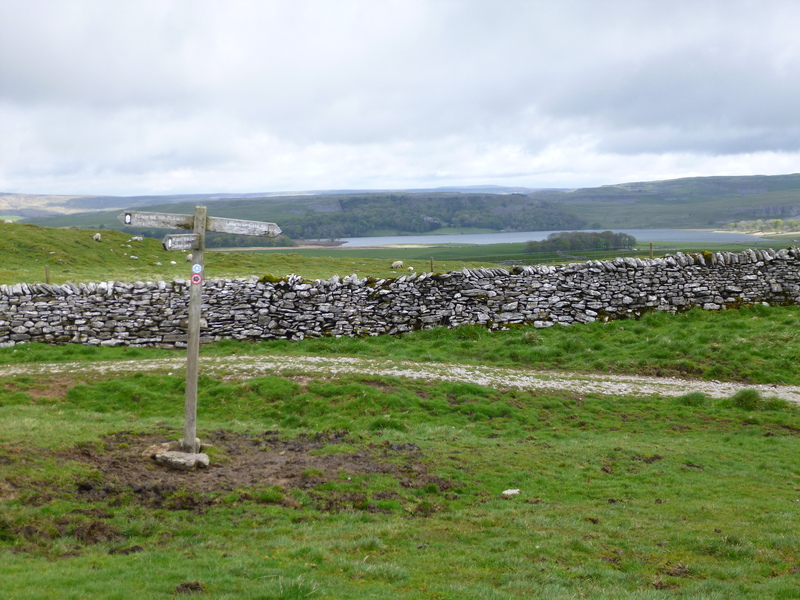 A rare waymarker post marked the point at which the Dales Highway left the road behind, leading onto a nice wide grassy path. 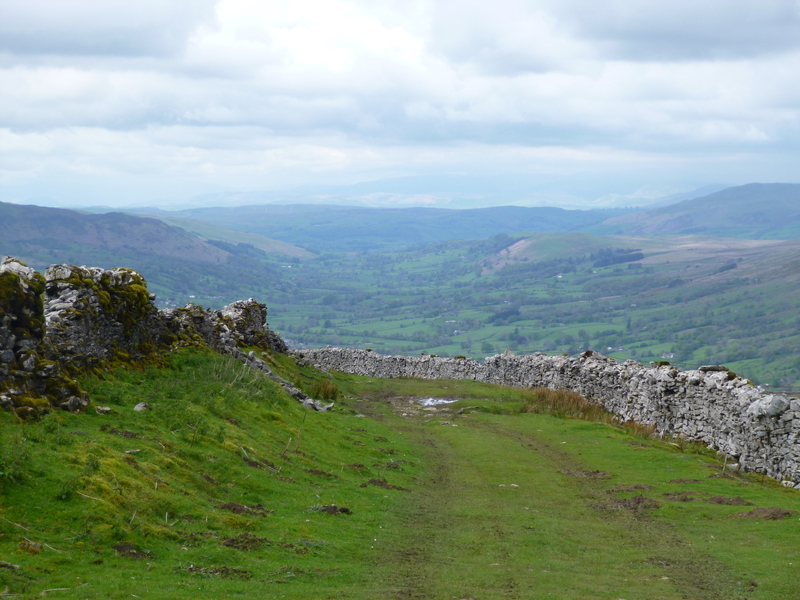 It was easy walking with fine views, not only of the Howgills, but of the Lake District as well, its hills gently gathering clouds in the west and for a while I walked with a couple of other Dales Highway walkers who had caught up with me. At Sunbiggin Tarn the path turned north, away from the Coast to Coast and started to rise towards the final high point, Great Kinmond, and its rather impressive outcrop of Limestone Pavement. A short road walk was followed by a lovely grassy track which meandered through rather stunted and wind blown looking hawthorn. 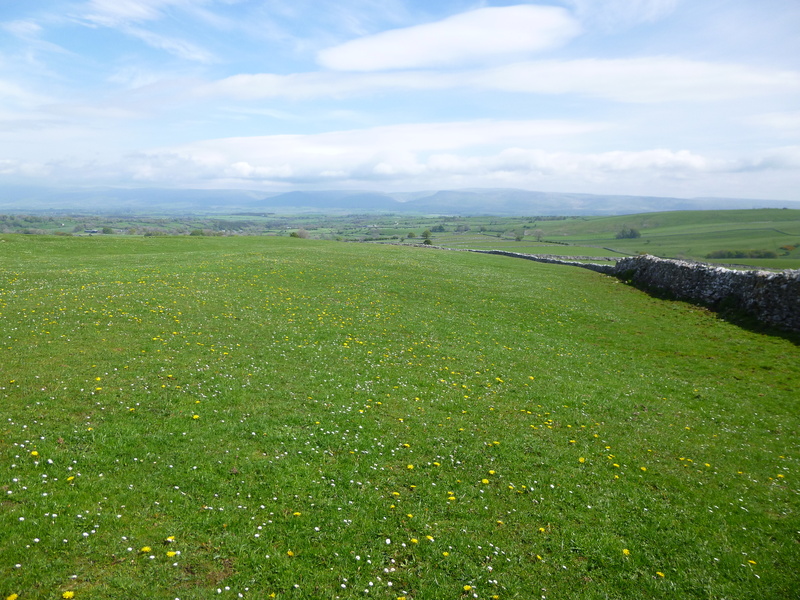 I paused here a while, enjoying the soft grass and the superb views back towards the Howgills. As I sat enjoying the view a couple of walkers appeared from the west and passed by me, heading up towards Great Kinmond. Noticing their C2C guidebook I asked if they were walking it, and receiving an answer in the affirmative politely suggested that they might want to go a different way! I’m guessing that they saw the other walkers ahead and, as all good sheep do, followed them. Great Kinmond was a fantastic spot. 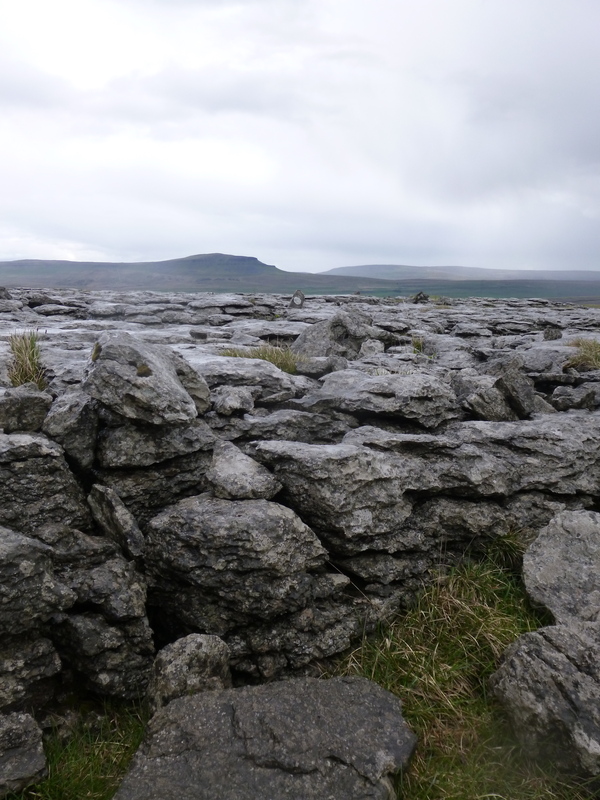 I love the look of the Limestone Pavement, there is something inherently pretty about it, the stone almost has a luminous quality to it. 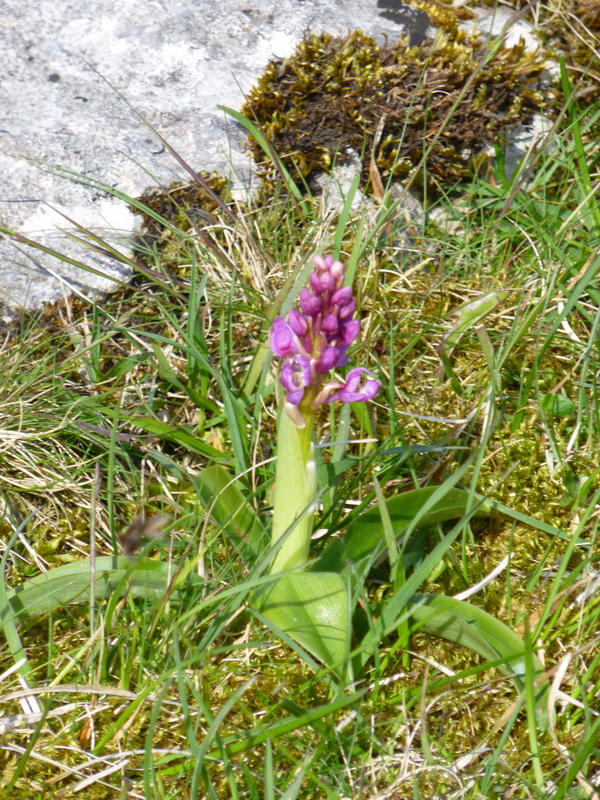 Also fascinating is the plant life that lives in all the fissures, and up here there was a plethora of orchids, always nice to see. The view wasn’t bad either – wide, almost a 360 degree panorama. So began the gentle descent into Great Asby, the hills to the north providing a wonderful backdrop. 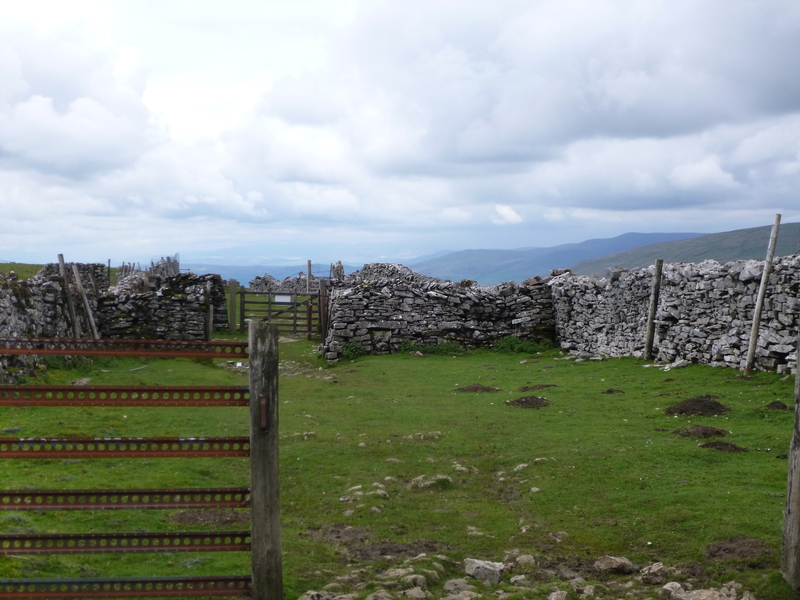 The easy walking was regularly interrupted by gates and the horrible stone pinch stiles that are such a feature of this part of the country – it would be fair to say I was knackered at this point and each one became a major obstacle. I passed through the cluttered farm at Clockeld (complete with very free range chickens) and into a lovely lane to the village. Although this was my first visit, it really shouldn’t have been. 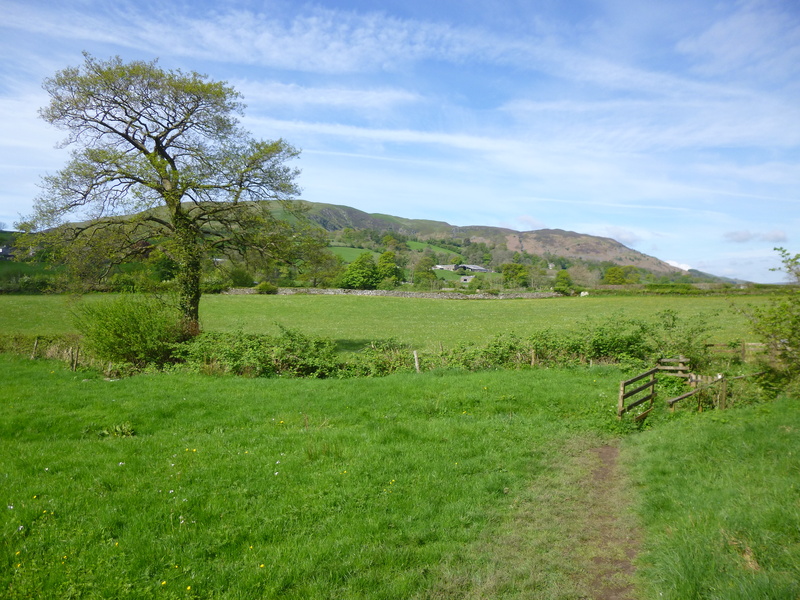 Due to a slight navigational error, I completely bypassed the village while walking the West Morland Way last year – it was supposed to pass right through the centre! Unfortunately the pub was shut, dashing my hopes and dreams somewhat! There was, however, a nice comfy large bus shelter which had lovely wide benches in which I stopped for lunch. It also had the added advantage of getting me out the sun for a while, which for the first time on the walk had really been splitting the skies. 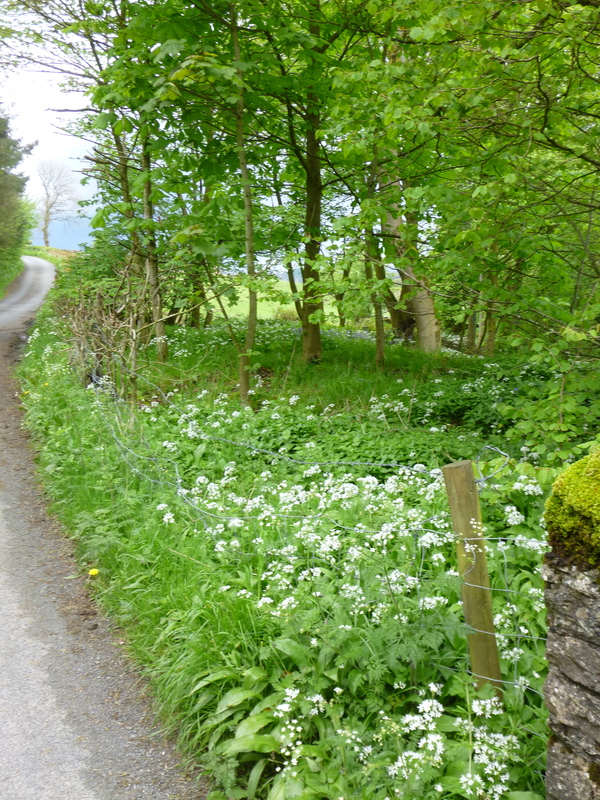 This was the last stretch now with a road walk to Howe Slacks where I would revisit the Westmorland Way. I was almost there when I turned to see a herd of young bulls running up the road, followed by a tractor. I stopped on the verge to let them past (there’s always one that wants to have a nosey) then carried on up the road. I reached my turning, a lane leading down to a small farm, only to find the herd corralled into a sort of hard standing area at the head of the lane. That was fine, no problem. I turned into the lane and started to walk down it. I was halfway down when I noticed they had started to follow me. Again, not really a problem, they are usually just nosey beasts. I passed through a gate in the lane, next to a field of what looked like young heifers. 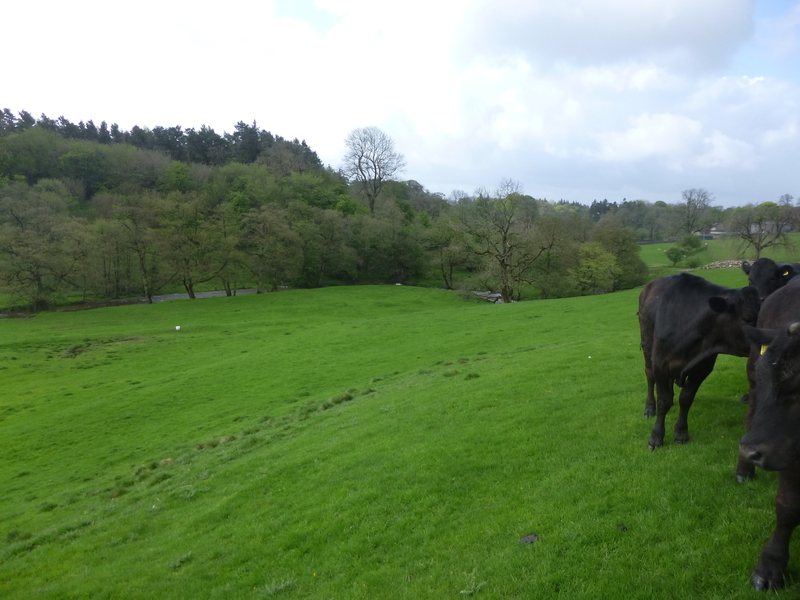 Lets just say I was glad to be in the lane and not in the field – they went ballistic (I’m guessing after spotting the bulls) – running -no – charging around fairly aggressively and stampeding up the fence line where I was walking. I’ve never seen cattle act like that before, and it is the first time I have been truly concerned being close to them. Needless to say, I quickly left them behind, entering some rich pasture land which was a lot drier than my previous visit. I also harboured some hope of spotting a red squirrel (as I had on the Westmorland Way), but I had no such luck. Rutter Force was running slightly more sedately than my previous visit and was looking very photogenic in the afternoon sun. 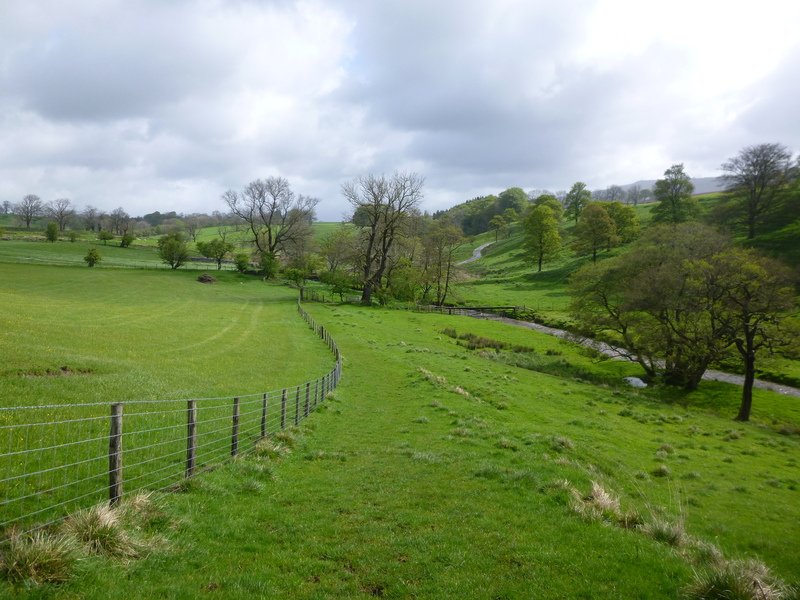 The route stayed with Hoff Beck, parting with the Westmorland Way, a delightful river walk, although a field with cattle proved to be a rather rough and energy sapping experience. It was with some relief then, that I emerged in Hoff to find the pub open. No more than 3 or 4 km from the finish it proved to be a welcome break which was much needed. It has only recently re-opened (a few days before) after a long while closed – the landlord and his wife are both walkers too and I spent a pleasant hour or so nattering. I hope it is a success! There were still a couple of challenges to complete, a steep climb up the river bank to avoid a collapsed boardwalk and a nice nippie sweetie just to finish me off. The brow of the hill did give a great view of Appleby though. From there it was a walk down a very muddy lane to emerge into a housing estate close to the town centre. 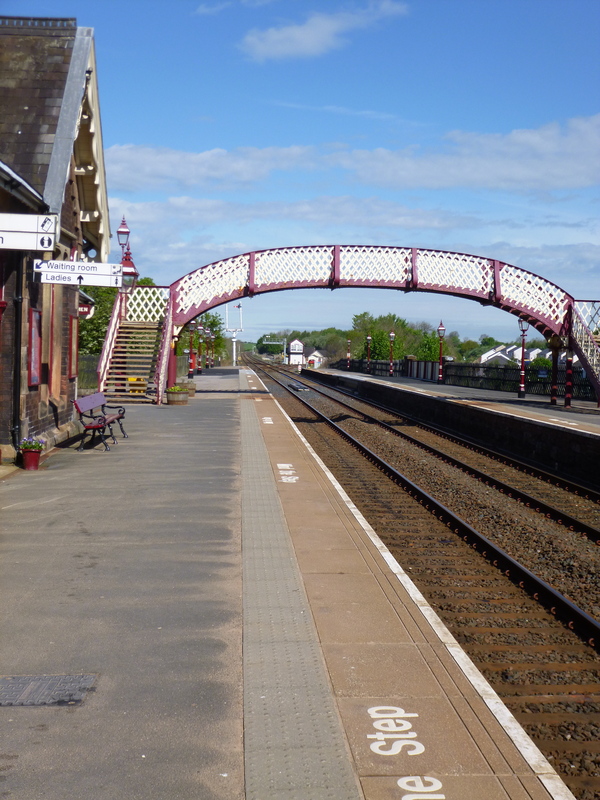 I entered Appleby the same way I had left on the Westmorland Way, this time though it wasn’t raining! All that was left to do was to enter the tourist information office and claim my certificate and sign the guest book! Superb days walking, helped by the weather of course. 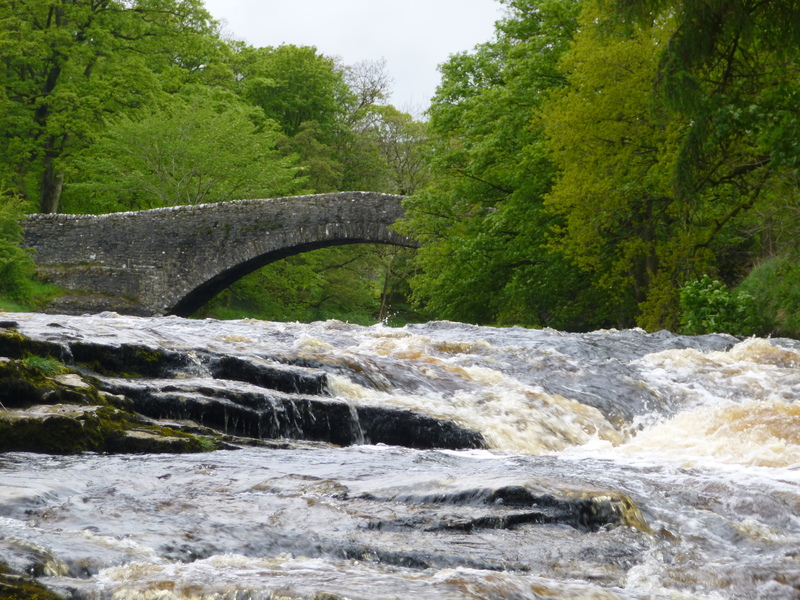 Fine views throughout, and it was nice to finish with a very pleasant river walk. Great Kinmond was a great final little hill, despite its diminutive stature it was a fantastic place to survey the surrounding area. Great day and a great trail. I spent the night at the Midland Hotel, right next to the station. It meant a steep climb out the town, but also meant I only had a matter of metres to go to get to the platform and my train home the next morning. It had been a comfortable night in the bunkhouse, if a little strange, rattling around such a large place by myself. As usual I was up relatively early and spent a bit of time pottering around and making breakfast in the fantastic kitchen. The forecast for the day had been superb – sun all the way apparently. On looking outside it was obvious that something wasn’t quite right. There was low cloud clinging doggedly to the slopes just above the bunkhouse, thick and uncompromising. 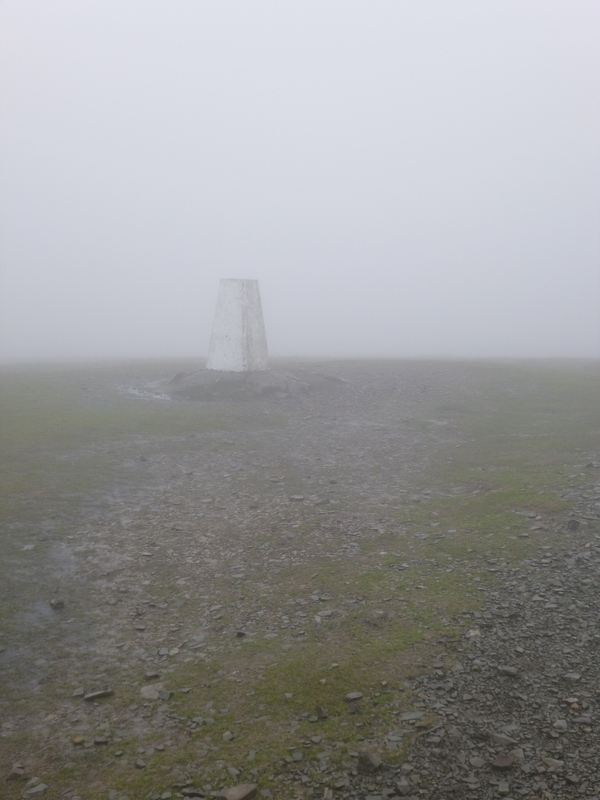 I had a decision to make – take the lower poor weather route, or cross the Howgills on the official route hoping that the cloud would burn off. 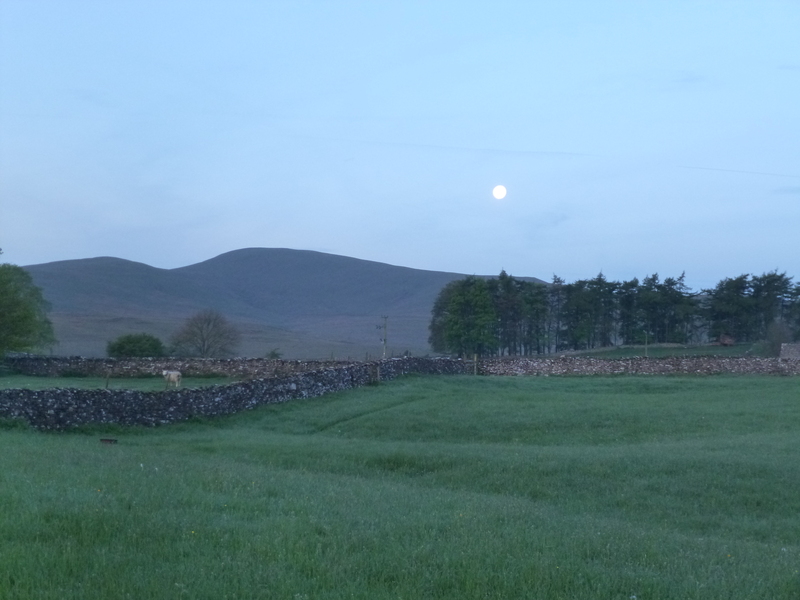 The forecast was good – I took a chance and decided on the Howgills. 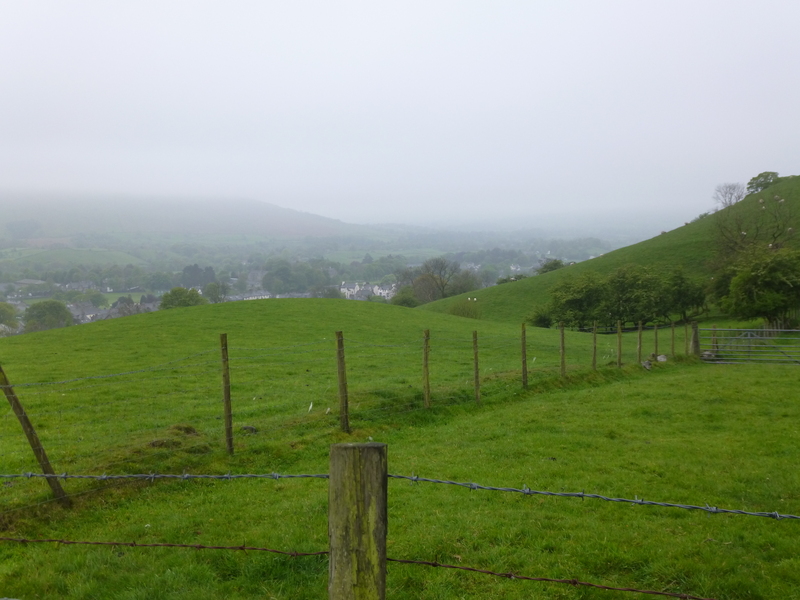 It was a steep, steep climb immediately from the bunkhouse which was almost right on the path and there were some good views over Sedbergh just before I passed through a gate onto the open hillside. The path I was following ran alongside Settlebeck Gill and I followed this steeply up the hill and into the mist. I have to admit to extreme laziness in terms of navigation, although I had map and compass with me the GPS made things nice and easy (I say that – I still managed to wander off route!) following what otherwise would have been an awkward route up the hill. It was a long old slog, and after what seemed like an age, I finally reached the clear bridleway which was the main path across the hills. 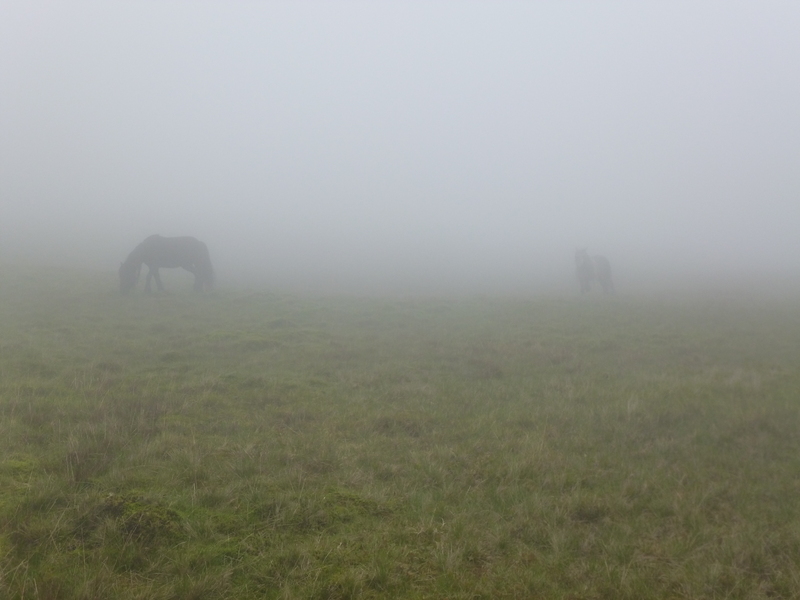 At this point a few shapes loomed out of the mist, a few of the horses that live on the hills. Visibility was dreadful – it was like walking through a TV set that had been disconnected from its aerial. I’m sure the views were great. I’m sure that I would have stood a while and admired the sublime views from the ridge up to the Calf. I’m sure that the ridge walk over West Fell would have been airy and spectacular – had the weather forecast been anything close to correct. There’s not much else to say about the walk over the tops other than I eventually made the trig point on the Calf with no sign of the cloud lifting. Rather than take the ridge route over West Fell (there was no point) I continued along the bridleway which dropped into Bowderdale. This was nothing short of purgatory, a nasty stoney path that meant I could never really place my feet flat on the ground. I was cold, wet and thoroughly hacked off with the Met Office and the fact that I had blatantly chosen the wrong option for the day. All in all it was rather dispiriting. It seemed like the Bowderdale path went on for ever, but eventually it started rising again to meet up with the ridge coming down from West Fell. It was a relief to be out on open ground again, and I took a good long break where the paths met. The cloud seemed to be a lot higher on this side of the hills and as I looked back at them after passing through the hamlet of Wath the forecast sun began to appear. It was suddenly muggy and warm, forcing me to take off the waterproof jacket and fleece that I had needed to put on well before the summit of the Calf. 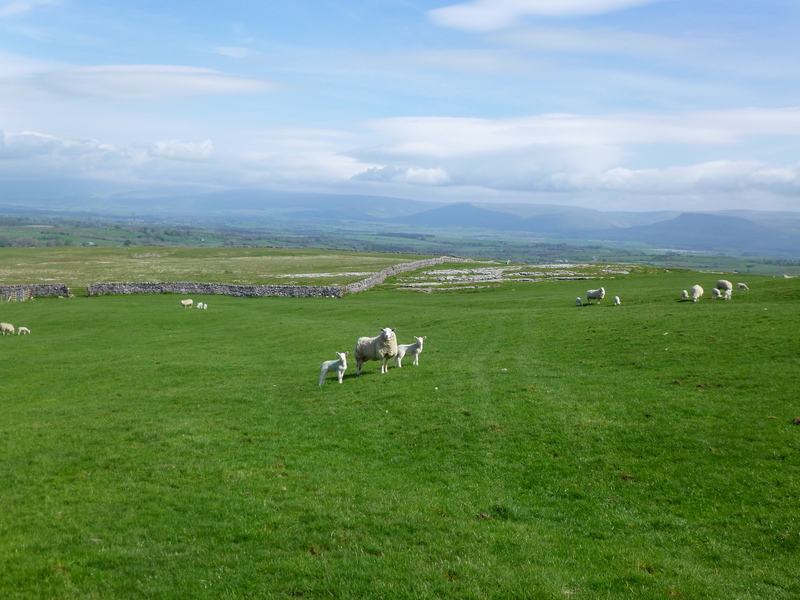 As I walked along the road to Newbiggin-on-Lune the sun came out with a vengeance and the cloud all but lifted from the Howgills, leaving them swathed in sunshine. 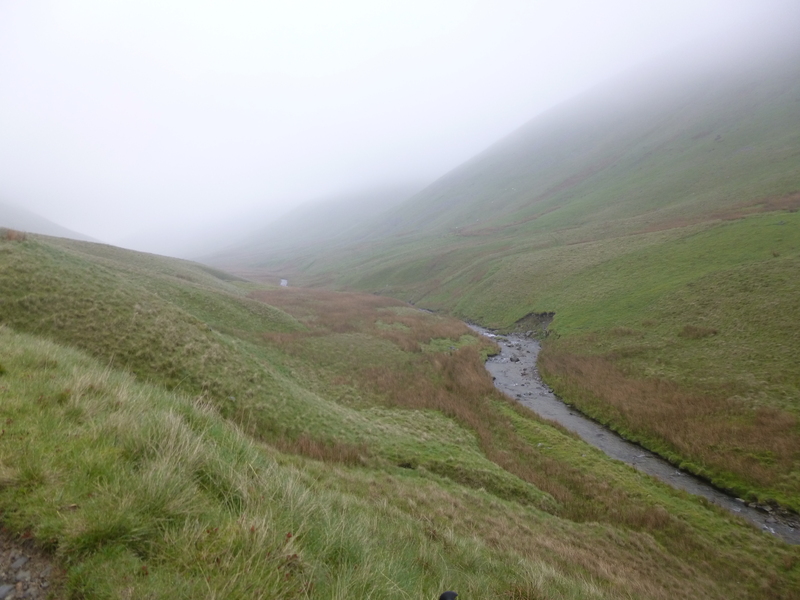 Ok so it’s a low rating, all down to the mist on the Howgills. It turned into a damp, cold and miserable tramp, even if the sun did come out towards the end of the day. In terms of anticipation, this was probably one of the most anti-climactical days I have ever had. The rating is purely down to my experience on the day. 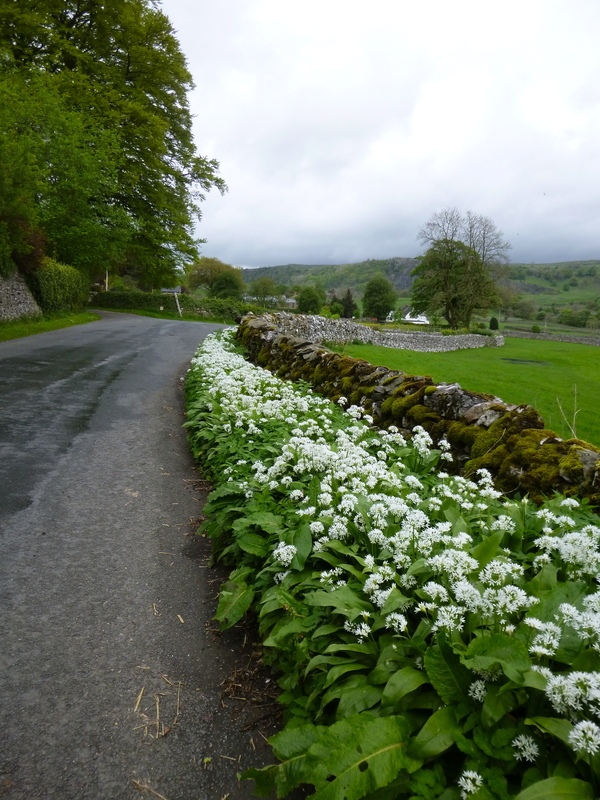 I am however going to give it a provisional 10/10 for the overall trail rating (it’s my blog and I can do what I like) as I’m sure that in any other weather conditions it would have been one of the best days on the Dales Highway. 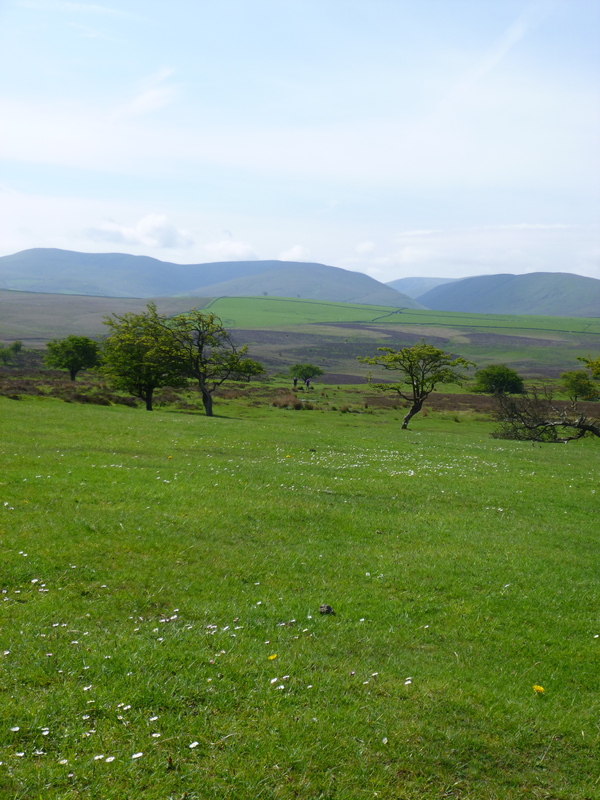 In fact, I had been assured by other walkers that the Howgills were not to be missed! However, the day was just a slog and the low level route off was not a pleasant hike. That could quite easily be down to the weather conditions as well though. The sun did eventually make an appearance at the end of the day, and it was galling to walk along the road to Newbiggin-on-Lune and see the hills with completely clear tops. The campsite was lovely though, with a fantastic aspect and very quiet with only a couple of other tents on the other side of the field. I awoke to a quite stunning morning in Dent, clear blue sky and the sun shining. There was a heavy dew though and a bite to the air. It must have been clear overnight as it had been a little cold at times. Despite the sun the cold air meant that the tent was taking its time to dry out. It was still soaking as I put it away in its stuff sack! The owner at Conder Farm is quite willing to do breakfast for the odd camper. He had a picnic bench outside his front door and it was a morning for an al fresco breakfast. Wonderful. After a brief diversion to get some lunch from the village shop (bumping into a couple of Dales Way walkers and the 4 friends from yesterday) I made my way through Dent and out the far side to pick up the Dales Way again. It could only be described as stunning. A fresh morning river walk in the sun. It was over all too soon as I reached Barth Bridge with its precarious steps and “door” stile. Here I managed to make a wrong turn, heading up the wrong lane (one too early), no doubt being distracted by the lovely display of wild flowers along the verge. Looking at the map I was heading in the wrong direction, but rather than drop downhill there were a few options that would get me back on the right track. It was at this point that the batteries on the GPS decided to expire, meaning that I had to stop, remove the backpack and huddle around inside for some new ones. As I sat replacing the batteries, a ewe and her lambs came running up, obviously mooching for food and not in the slightest bit concerned with my presence. In fact once I set off, the followed me to the edge of the field. As impromptu diversions go, this wasn’t a bad one, and in fact I was furnished with some fabulous views of Dentdale from what looked like little used tracks. The only downside was I had a number of old ladder stiles to negotiate before I got back on route. Back on the official route I followed the narrow road up to the remote Lunds Farm, to be greeted by a rather enthusiastic Jack Russel. 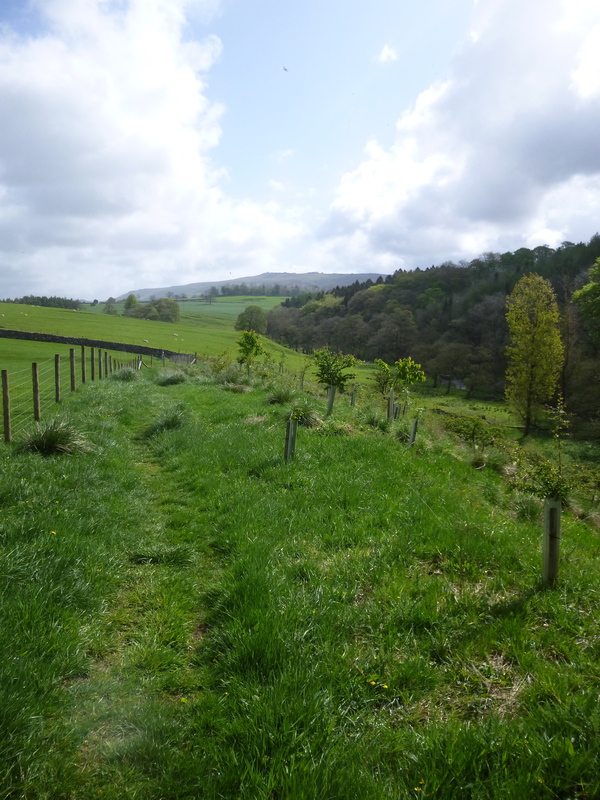 From there, a rather curious enclosed bridleway took the path onto the open hillside. It was wet and muddy in places, sometimes so narrow that a large quad bike would struggle to pass through and in other places it was as wide as a good sized road. Eventually one wall ended, although I was still climbing, and I passed the group of four women who were lounging on the grass enjoying the sun (who can blame them?). I stopped and chatted a while, explaining that I had managed to go the wrong way, much to their amusement! From there it wasn’t far to the top of the hill, and at the brow the Howgills appeared, glorious in the sun with blue sky and just a few wispy clouds overhead. Here disaster struck. My SD card for the camera was full. “No worries”, I thought, “I have a spare”. The spare had a capacity of around 12MB and had space for just 1 photo. Bugger. Despite the warm day it was a wet and soggy descent into Sedbergh alongside Holebeck Gill, bog cotton and sphagnum moss weren’t in short supply. 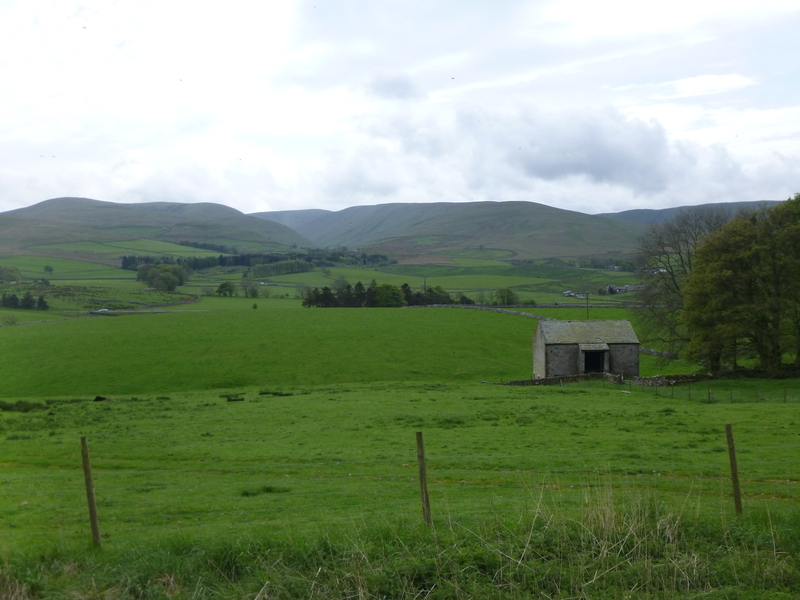 There were still fine views of the Howgills and the town across Garsdale, and I lingered a while to enjoy them. 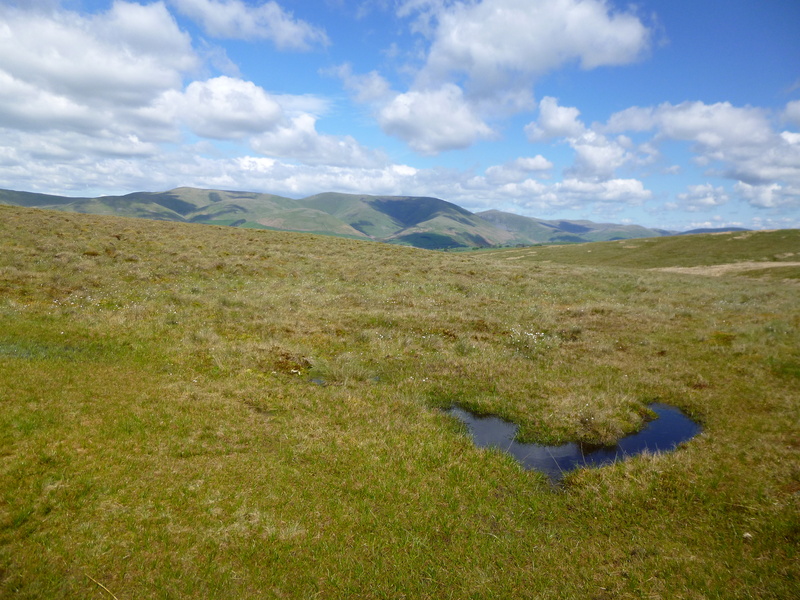 The forecast for the next day was superb and I was looking forward to the traverse of the Howgills – I was also contemplating the fact that I needed to find a new SD card for the camera as a matter of urgency. 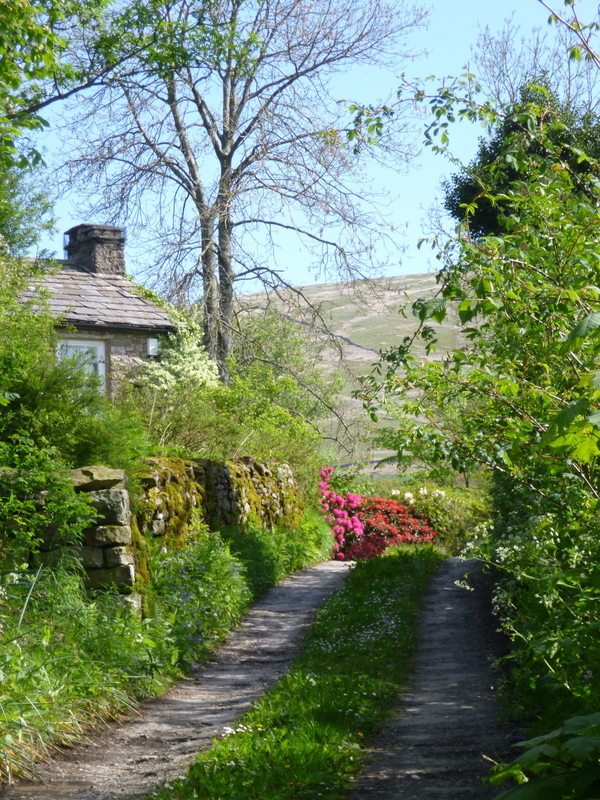 The track turned into a lane and I was soon passing between farms and typical country houses before reaching the busy road into Sedbergh. This, I would suggest, isn’t the best route into the town, and made for a nasty little section to walk along a road which had no pavements. I passed the caravan site as my destination was a bunkhouse in town, and headed for the town centre. I spent a while wandering about trying to find a shop which might just sell SD cards, with very little success. Eventually I asked a local, and as a last resort they suggested I try a small office supply place up a back alley. It was the last place I looked, and to be honest I hadn’t got much hope. Amazingly they had one – 2GB as well, which should be more than enough for any walking trips in the future. Finishing my quest I made straight for the nearest pub for a couple of light refreshments before heading up the hill to the bunkhouse. The Howgills Bunkbarn sits just above the town on the lower slopes of the Howgills (as the name suggests). As bunk barns go, it is a little expensive, but it is in fact worth every penny. In stark contrast to the Station Inn, this ranks as one of the best places I have stayed in – ever. I also had the place to myself! I dumped my gear and walked back down into the town to get some food, and for some breakfast supplies. 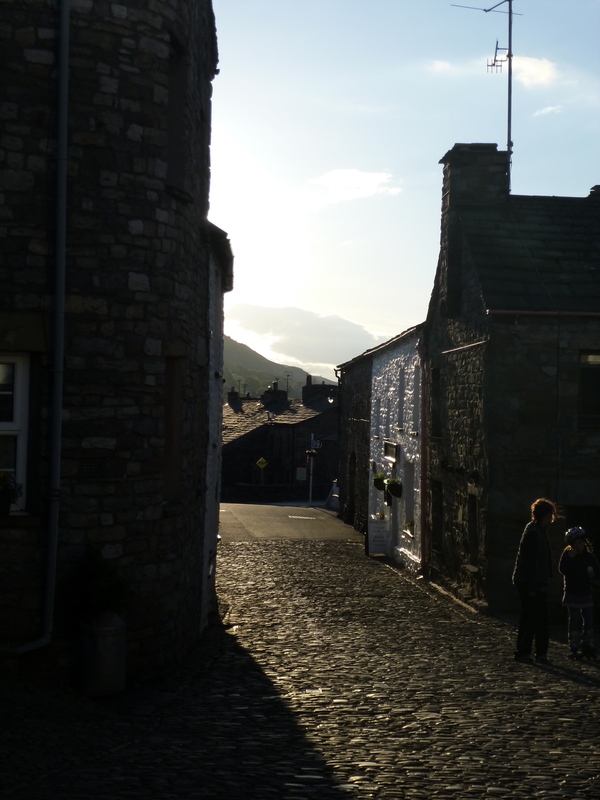 I bumped into the group of 4 women who invited me for a drink, and I spent a very convivial evening at the Dalesman before heading back up to the bunkhouse. Once again another stunning (if short) day. Dentdale was just fantastic in, and the diversion quite possibly was an improvement on the original route, even if it did add an extra mile or so onto the day. 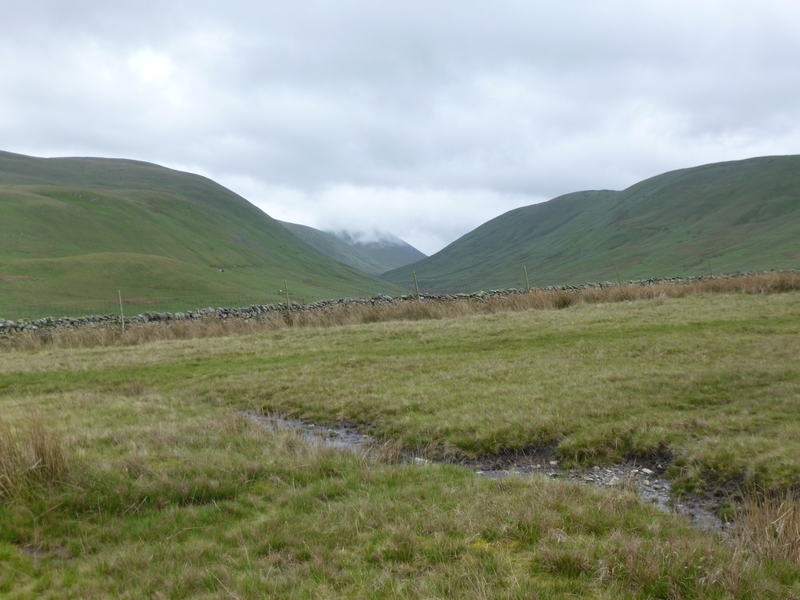 The Howgills looked really enticing as well and I was looking forward to a spectacular day tomorrow. Once again a fabulous days walking. 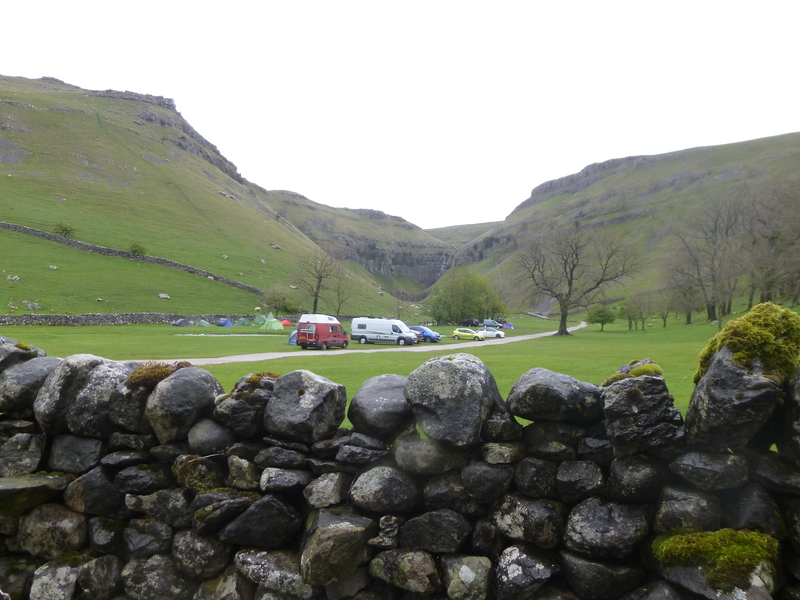 The campsite at Stainforth had been superb, they had a large amenities block with showers, toilets, pot room and laundry room. Even vending machines and radio piped through the whole building. 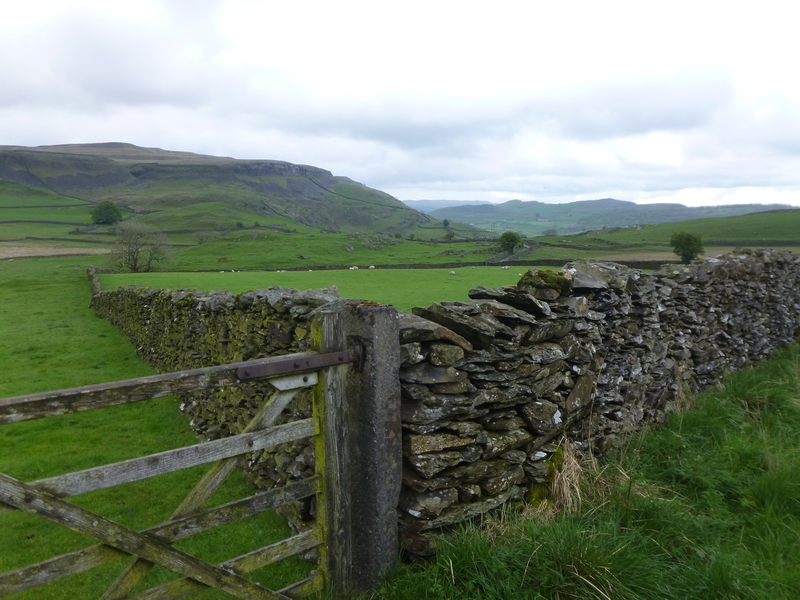 I had walked the short distance to the pub in Stainforth the previous evening, in between heavy bouts of rain, after pitching the tent and spent a pleasant evening next to an open fire, chatting to the landlady, and with another couple who came in during the evening. I awoke at 5 after a decent nights sleep. There hadn’t been much rain overnight, or at least if there had I’d slept right through and not noticed it. The tent, however, was saturated in the morning and with it being quite cool, wasn’t likely to dry off any time soon. I packed up quickly and dropped my back pack in the amenity block and proceeded to make breakfast on one of the picnic benches just outside. It was overcast, but was one of those mornings on which the sun seemed to be wanting to break through. It was an uphill start – a steep uphill start, right from leaving the campsite, and for once I was glad that the morning was cold. 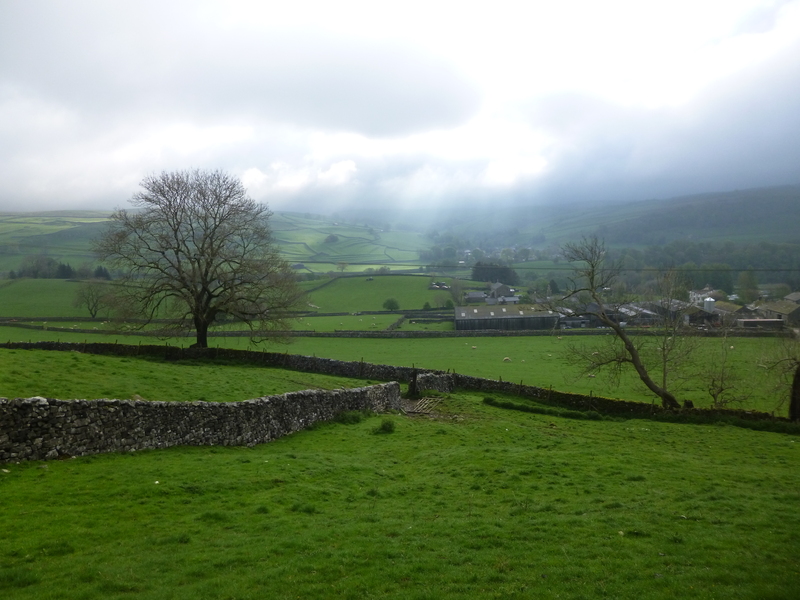 There were fine views back over the Ribble and towards settle, all dark and brooding. It was a lovely spot. 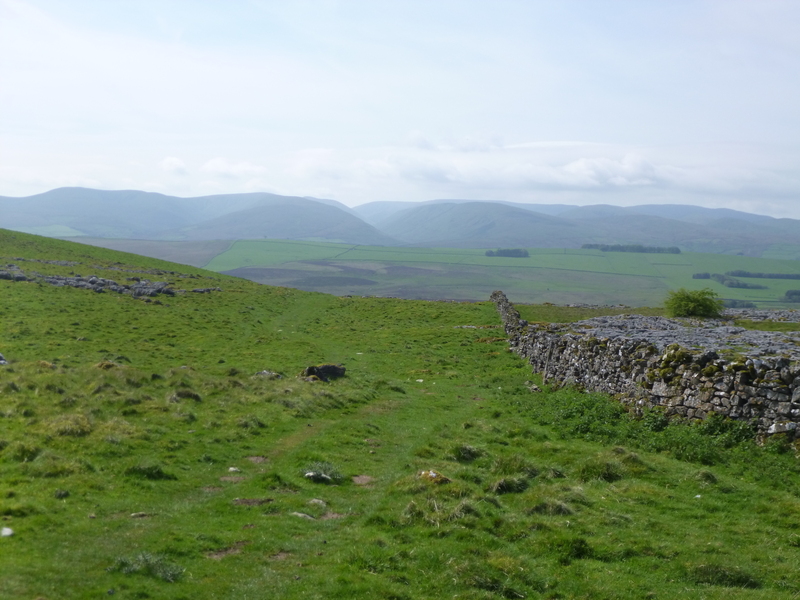 The farm track turned into soft green grass and I slowly climbed the slope towards Smearset Scar. Finally it appeared, shrouded in mist and full of drama. There was an eerie silence here as well, there was no wind and no noise other than the occasional “caw” from a crow – combined with the mist it gave the Scar an otherworldly feel. All too quickly I left the Scar behind, dropping into the small hamlet of Fiezor. It was a mark of how early I had started that the (rather good looking) cafe wouldn’t open for at least another hour. 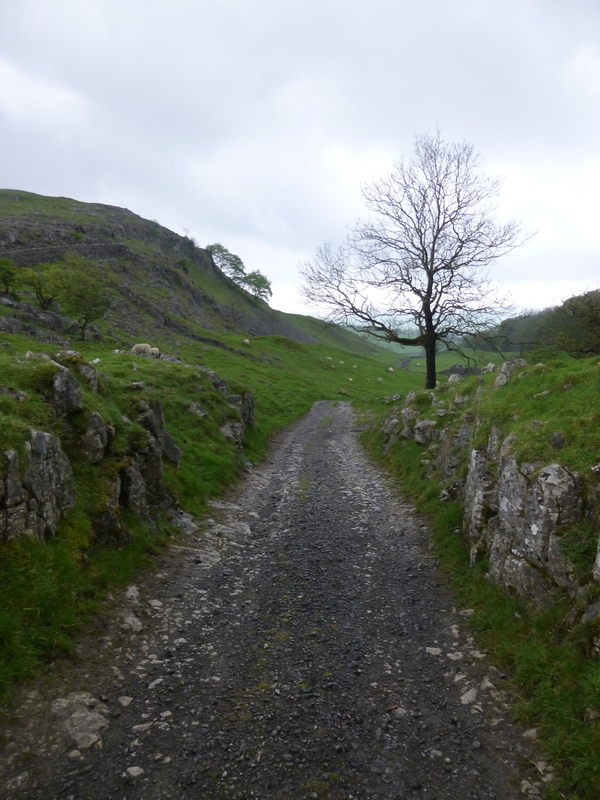 From here I turned onto a bridleway to walk up past Feizor Wood through another smaller limestone scar. 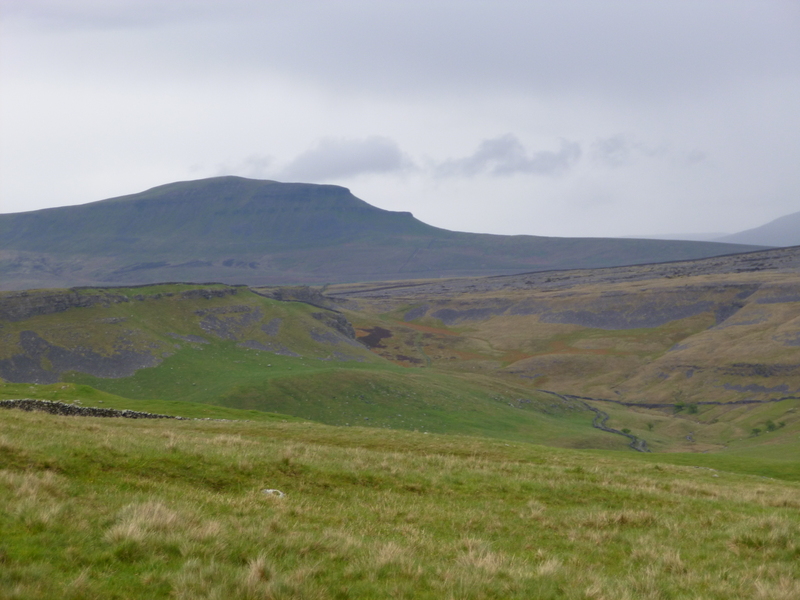 At the brow of the hill the view was immense with Moughton Scar and Pen-y-ghent dominating the view. 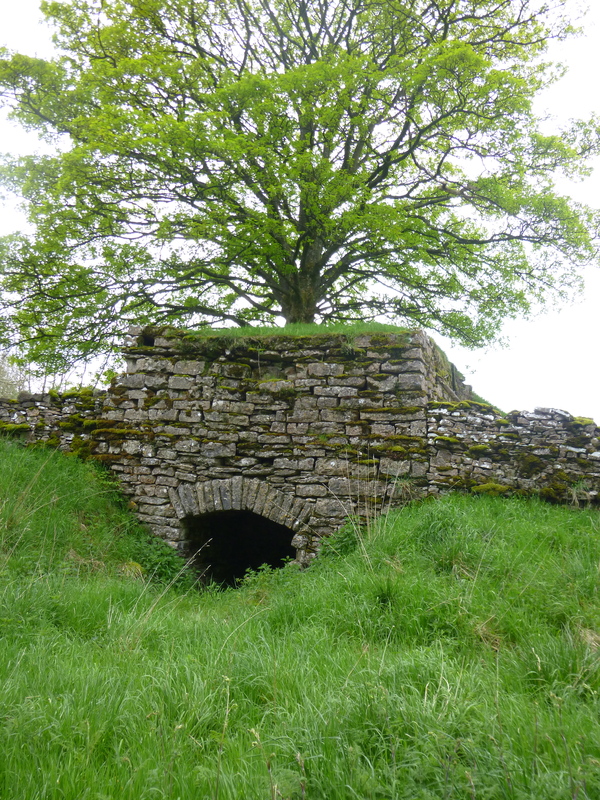 In a way, even more spectacular, was Wharfe Wood – a local nature reserve. 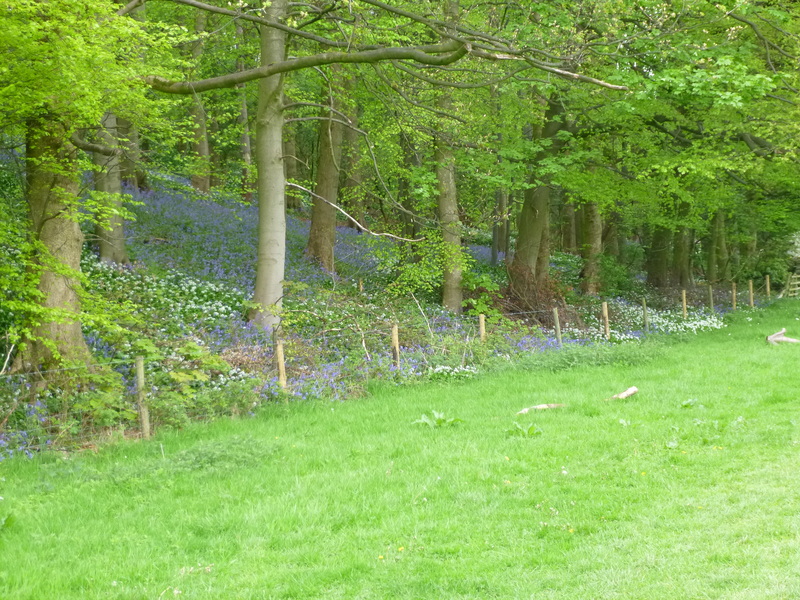 I popped my head over the gate to have a look – the covering of bluebells was incredible. 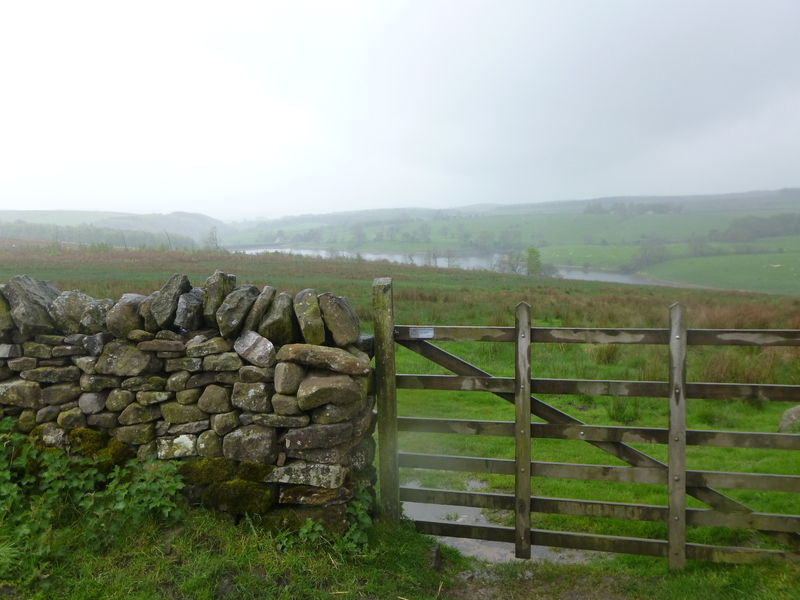 I carried on through fields down towards the hamlet of Wharfe, delightful walking punctuated by a few too many ladder stiles for my liking (it was more like the 500m hurdles). 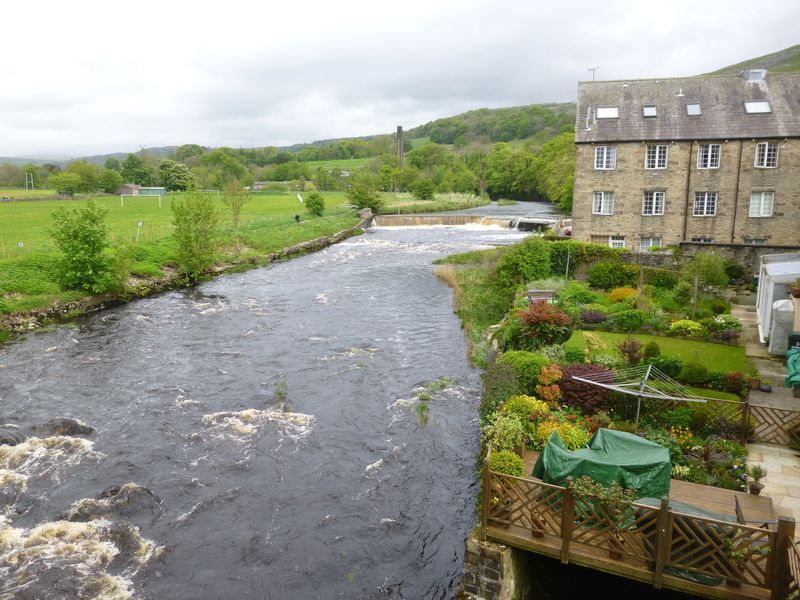 Wharfe itself was caught in a time warp. I can’t imagine that this place has changed much since the 19th century. 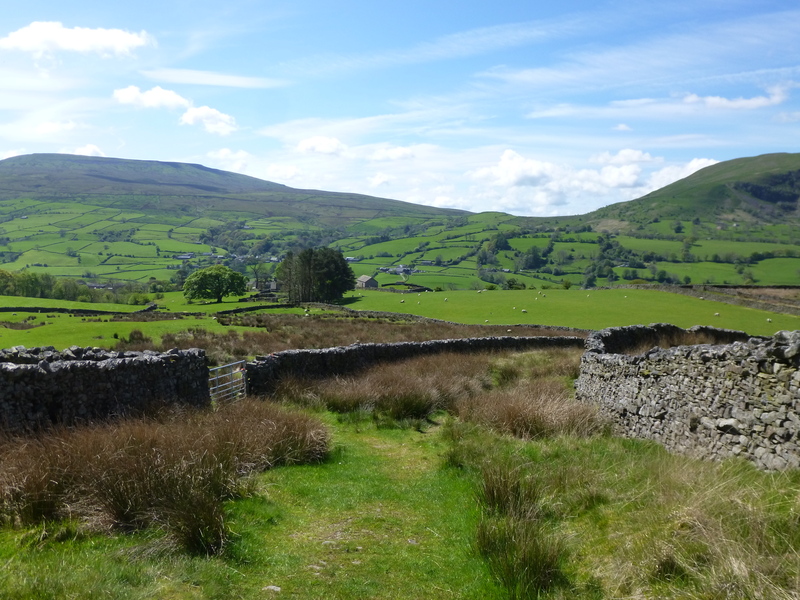 I was now on an old packhorse route, a narrow track running between two drystone walls. 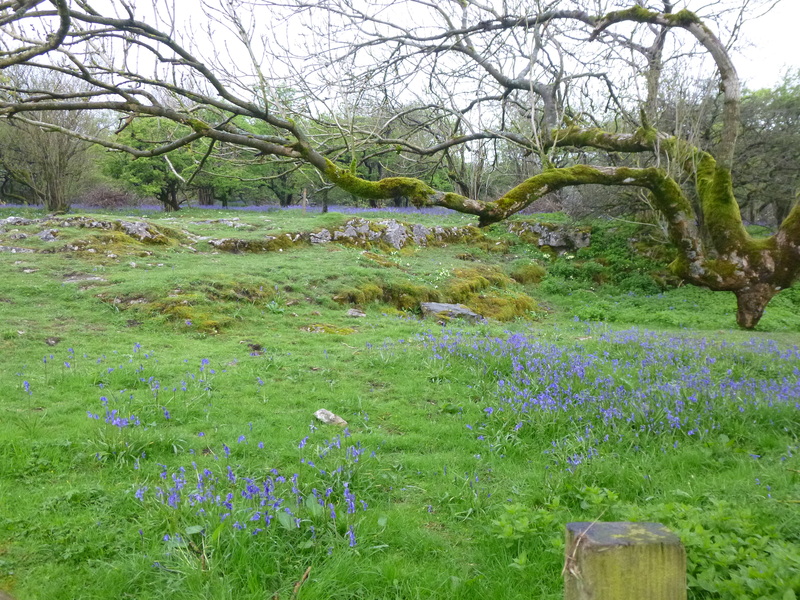 All the way along the verges were blanketed with bluebells, another quite incredible display. I reached Clapper Bridge and the Wash Dub field, and had a rest on the bench there to eat one of my cereal bars. 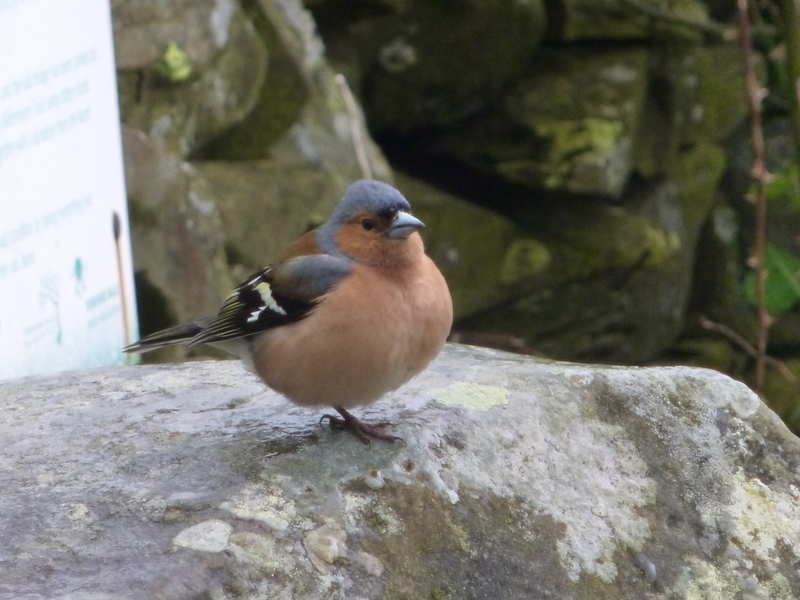 Almost immediately a cheeky little Chaffinch, piping at me until I shared some of my bar. He ate it and flew off, only to return a short time later with his mrs. It is a popular picnic spot after all I suppose! It was all uphill now towards Crummack, as the rain started falling heavily. 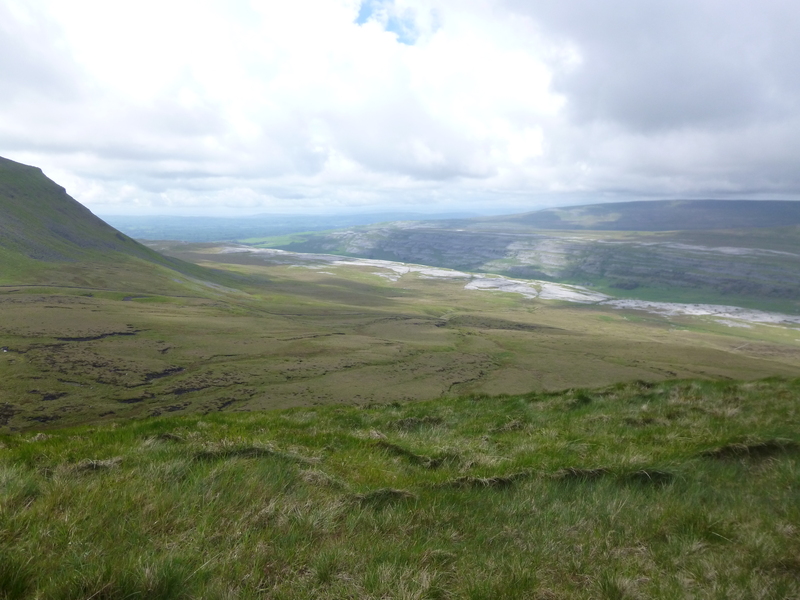 Soon I was out on open moorland again with Ingleborough dominating the view north. 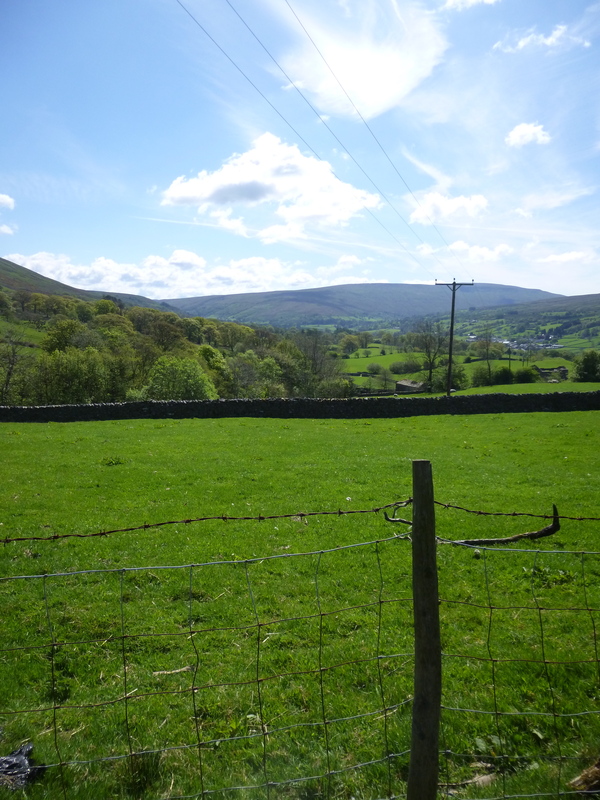 There was a short steep climb up to rejoin the Pennine Bridleway and it was here I had to make a decision. Would I go over Ingleborough or take the bad weather route which would give me a bit more of a direct route to Ribblehead. 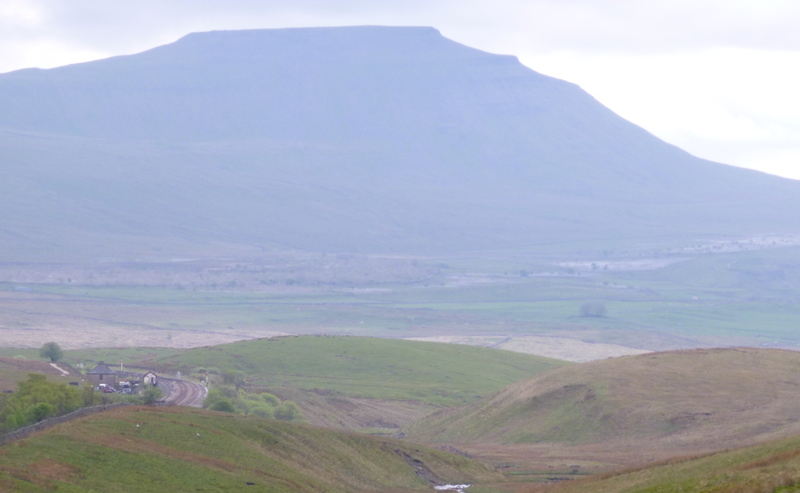 While the weather during the morning hadn’t been great, the cloud which had been shrouding Ingleborough was lifting leaving the summit clear. The route up didn’t look like too much of a steep climb so I decided to go over. 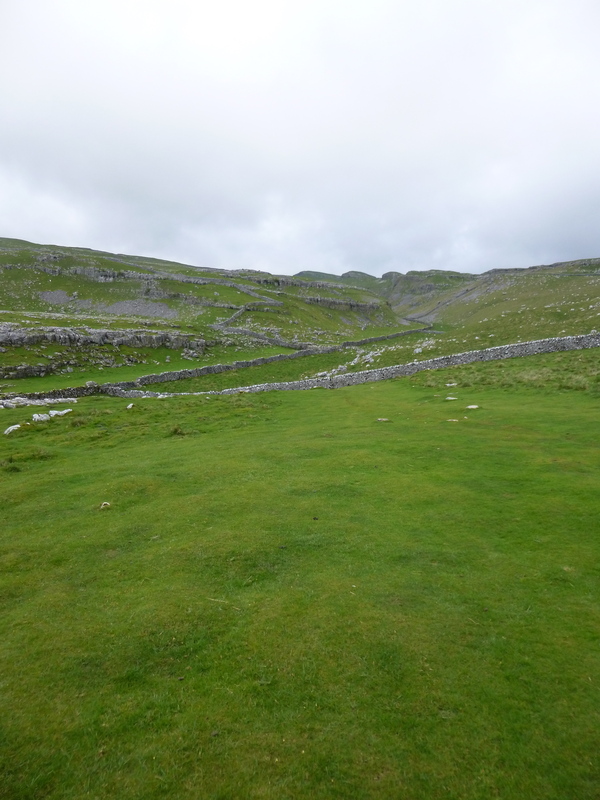 There was a huge expanse of limestone pavement here, and walking through it was a superb experience. It is a landscape that is unique, rugged and bewitching, giving an altogether an ethereal experience, especially on a cloudy day. The ascent was easier than I expected, just a steady climb until the very last push to the summit. It was here that I met the first walkers of the day, heading down the path I had just come up – a bit of a surprise as I had imagined this to be one of the busier sections of the route. 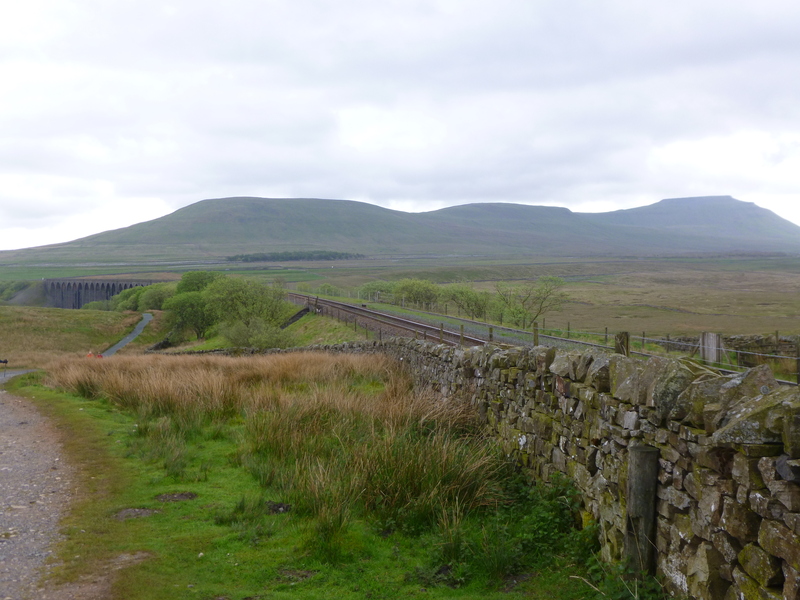 I decided to forego the walk to the trig point and instead head straight off towards Ribblehead. 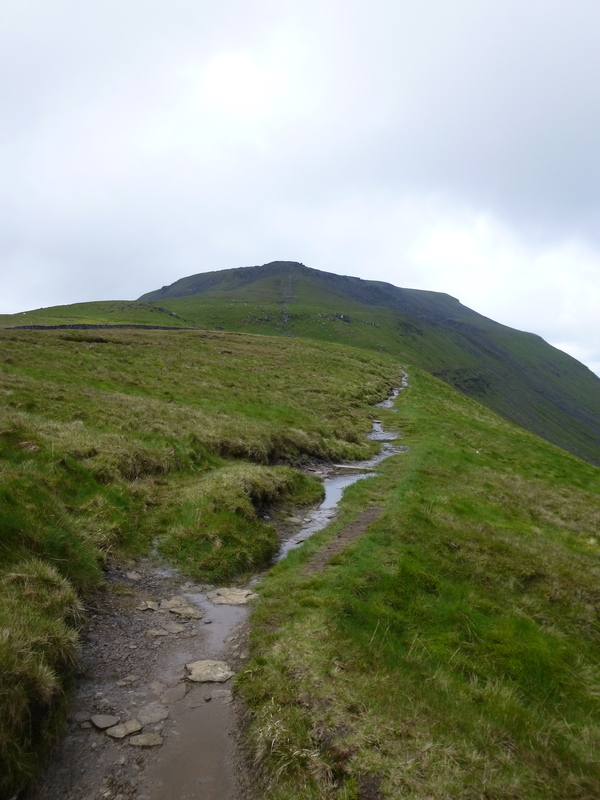 The official route, which headed straight over a rather precipitous looking slope, was left behind and I followed the ridge route along the edge of Simon Fell. This was just an incredible place with wide-open expansive views to the north. 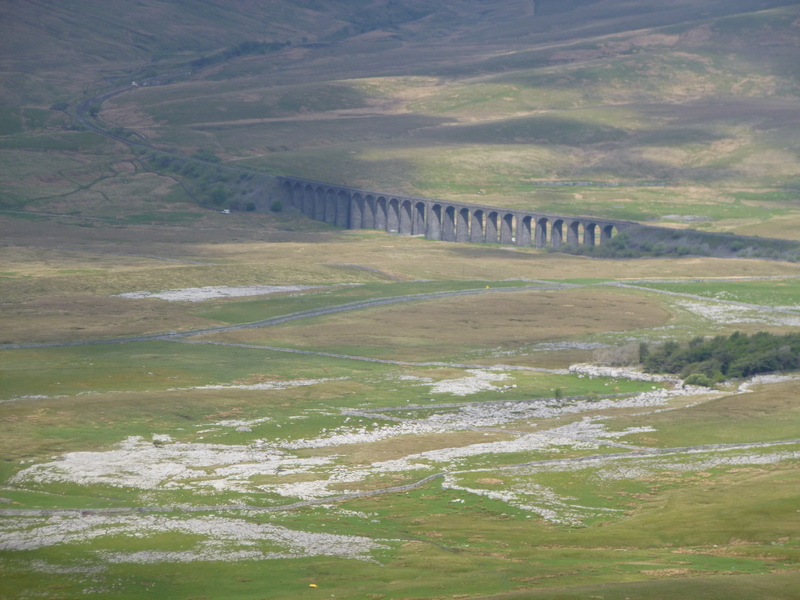 Ribblehead viaduct gradually came into view, but more impressive was the view from above of the valley and limestone pavement around Chapel-le-Dale. 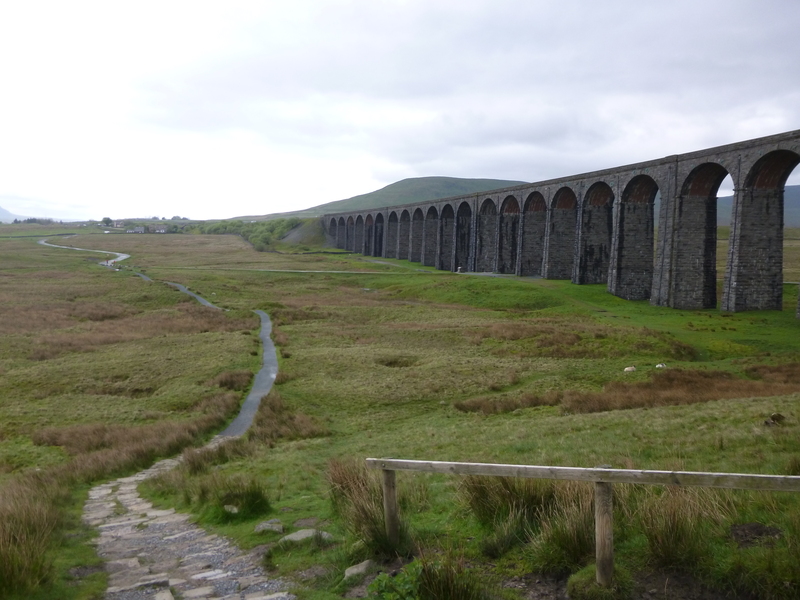 The ridge walk was fine and easy, all the way to Park Fell and I could mark my progress towards Ribblehead by the size of the viaduct. Eventually the ridge ended and a tricky descent ensued. It was steep and slippery and even with the walking poles it took a long while to reach the gate at the bottom with the legs burning badly. I took the shortcut route via the quarry and happily fell through the door of the station inn for a well earned pint. Another day that is right up there with the best from start to finish. 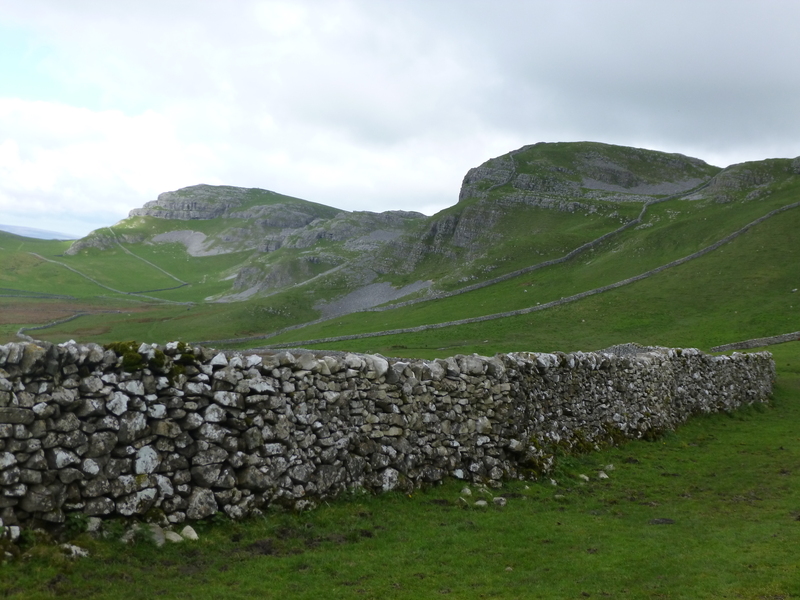 From the limestone scar at the top of the climb out of Little Stainforth, the bluebell lined bridleway and woods to the lovely time warp village that is Wharfe, not to mention the spectacular Limestone Pavement on the ascent up Ingleborough this was a day walk that had almost everything. 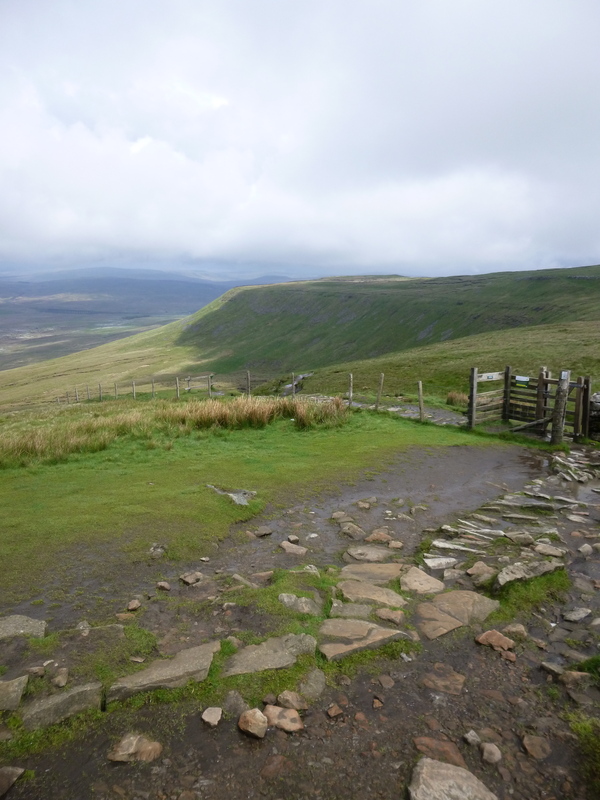 Finished off nicely with a fantastic ridge walk to Ribblehead. It was only a pity the weather couldn’t have been better, although the worst of it was a short heavy shower as I reached Crummock. 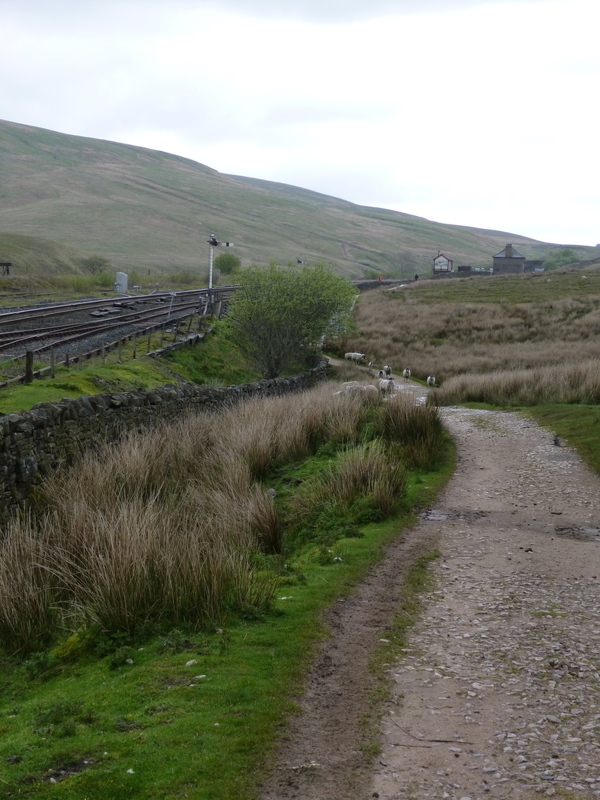 A “special” mention now for the Station Inn at Ribblehead. I’ve never stayed there before and had seen many mixed reviews on the internet – still I had an open mind. On arrival I had a pint, and got the feeling that I was interrupting the barman’s important dealings on his mobile phone. In fact, I felt about as welcome as a fart in a lift. I had booked a bed in the bunkhouse for the night – it is quite possibly the worst accommodation I have stayed in anywhere (that I’ve paid for) and I’ve stayed in some interesting places. It was essentially a glorified bothy. The only redeeming feature was a small electric heater that at least meant that the room was warm overnight (and I had a room to myself). Even when I went for a meal and asked to set up a tab they wanted me to leave the card behind the bar because they had had a number of “eat and runs”! Added to that, having paid for everything up front accommodation wise (including breakfast), I apparently didn’t exist the next morning, and they had no record of my ordering breakfast. Just to put this into perspective, since I started trail walking in 2004, this is the first time I have really not been impressed with where I have stayed (with the exception of the ACE hostel in York, but this was a different league). Crap welcome, crap accommodation, good beer and reasonable food. Pity because it could be a fantastic place. Still, it didn’t take anything away from the day, and it saved me from wild camping out the back of the pub on what was a pretty grotty night. After a couple of beers the previous evening I had retired early to bed. The hostel was pretty full and I was sharing a room with a group of bikers who were touring the North of England with no particular plans about which route they would take. The room had been like a sauna overnight and I had slept fitfully. In the more wakeful moments I could hear the wind and rain lashing at the window, not too encouraging for the next day. However, all was calm when I woke, and I took my time packing (much easier when not using the tent), going down for breakfast at half seven. 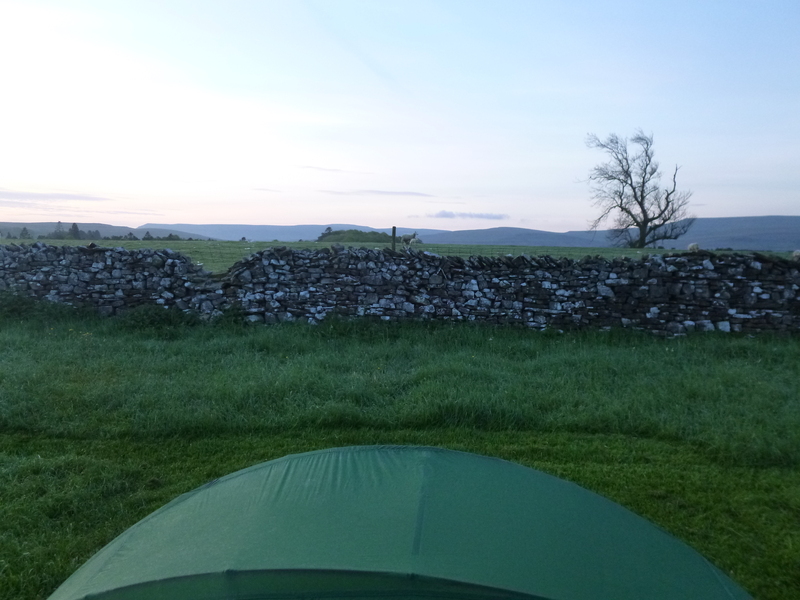 It meant a nice leisurely start at around 8 o’clock, late for me, but apparently early for everyone else in Malham. 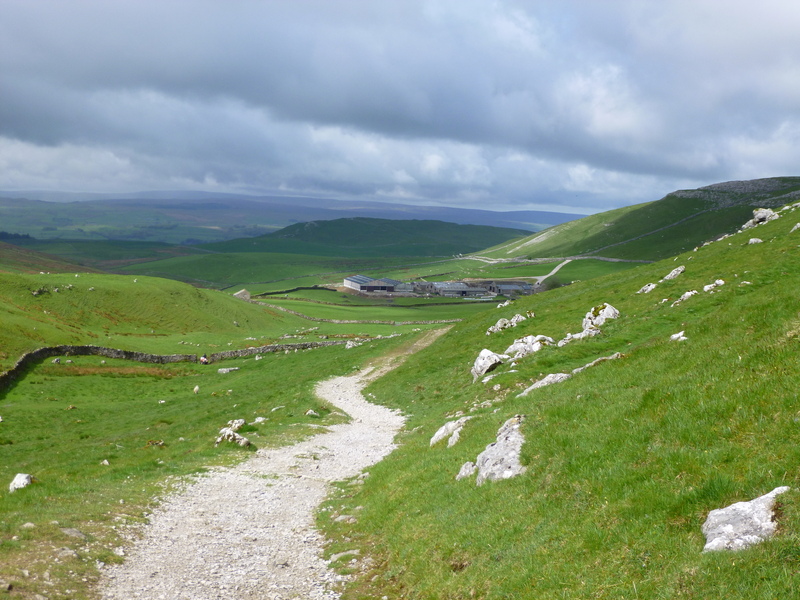 I left the hostel and rather than use the Pennine Way, I made my way up the road back to the official route to approach Malham Cove from above. There was no one around, surprising as I had at least expected to see a few walkers out and about. The rain from the day before had got to my camera as well. It had developed condensation inside the display screen, and had started to go what can only be described as haywire automatically going into video mode every time I switched it on. I could though, with timing, still get the odd photo in and hope that it would eventually dry out. The road was steep, but almost immediately the views back south were fantastic. Also there were well preserved mediaeval field terrace systems clinging spectacularly to the ever steepening slopes. 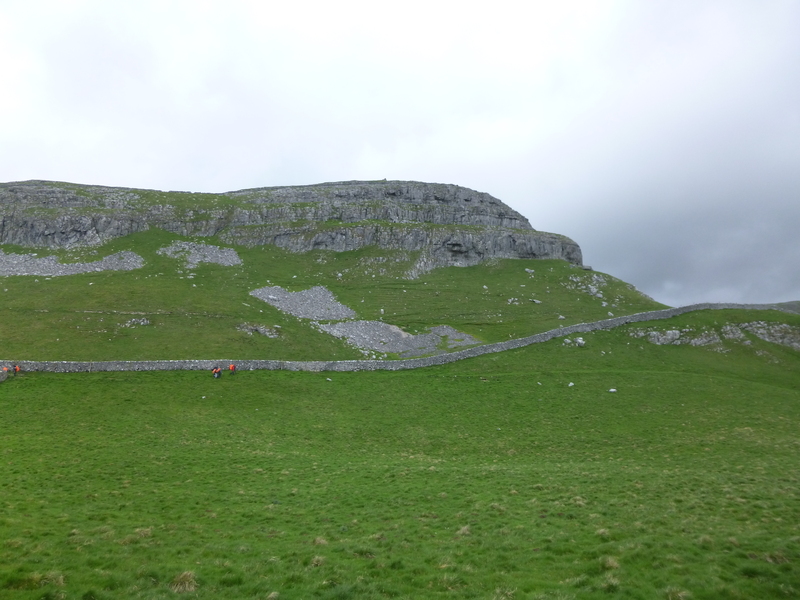 Eventually I met back up with the Pennine Way at the top of Malham Cove. It was deserted here and it is safe to say it is a breathtaking place even though the dry valley had a bit of an eerie feel to it. It was superb walking (and dry), finished off nicely by a climb up some rather treacherous limestone steps. At the top of the steps the Dales High Way left the Pennine Way to head uphill to Cove Road, which it crossed to pick up a byway which lead to the Pennine Bridleway. Looking back towards Malham Tarn and Cove there were spectacular wide-open views – some of the best so far on the route. I settled in for a steady haul up towards Kirkby Fell, and while there was no view to my front, there was always the option to stop and look back or South, the distinctive lump of Sharp Haw standing out clearly in the distance. The brow of the hill was finally crossed by Kirkby Fell and an impressive vista emerged in front of me. Not a beautiful, but rather majestic, one with long views into the distance. It was here, close to Stockdale Farm, that I met the first walkers of the day coming in the opposite direction, and suddenly the path was busy. The sun even came out, fleetingly! What came next was a huge surprise. The track had turned into a road, making the going quicker and easier (if not so much on the feet). 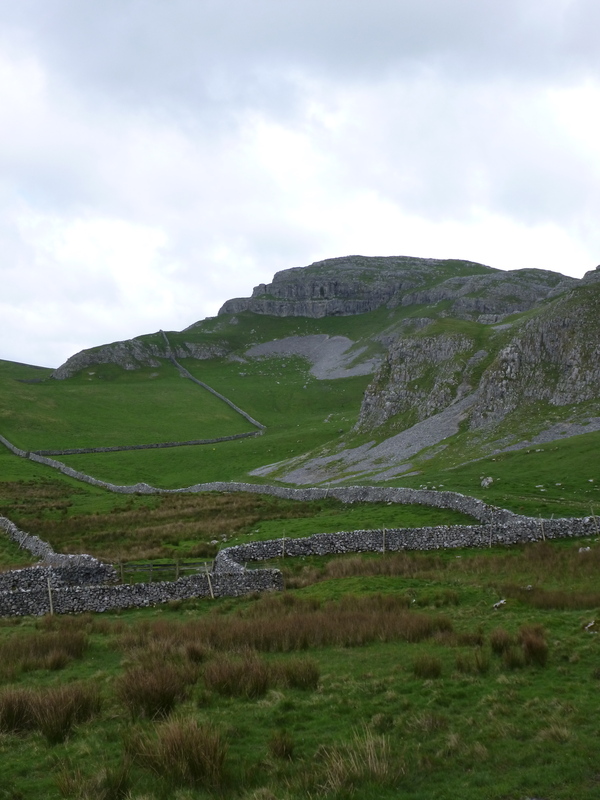 I turned a corner and bang, the spectacular limestone crags of Attermire Scar and Warrendale Knotts right next to the path. 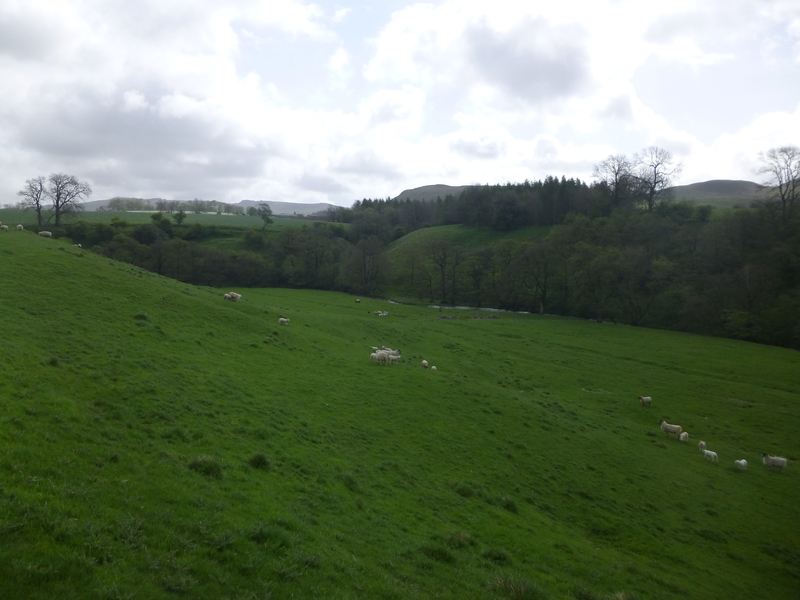 The next stop was Settle as I passed under the limestone crags (full of caves in which have been found Roman artefacts, but also the bones of a hippopotamus (amongst others!)) and several DoE groups passed in full wet weather gear and carrying their ubiquitous overly filled backpacks, (I can’t really criticise too much, I was carrying too much as well). 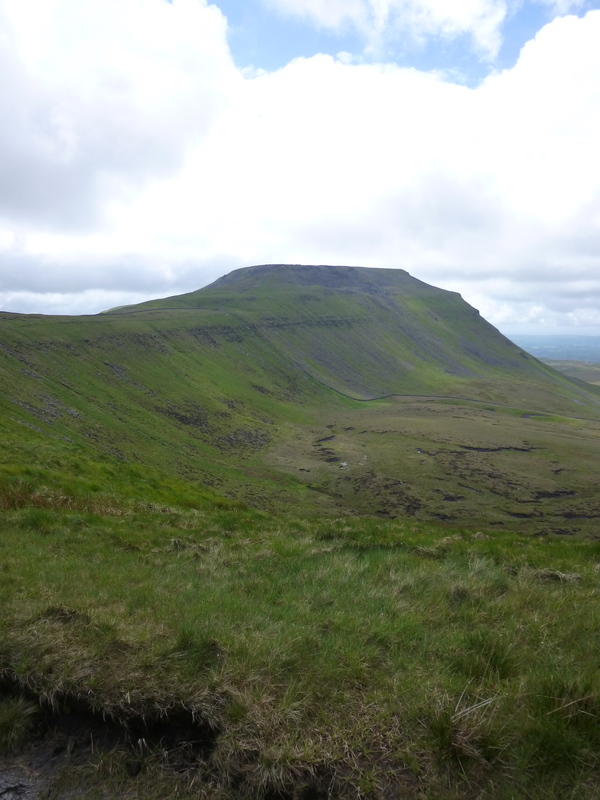 Eventually the route cleared the cliffs, leaving me overlooking Settle, the next landmark on the Dales High Way. In the distance the large lump of Ingleborough had appeared, shrouded in cloud, and just to the north the rain was falling heavily. 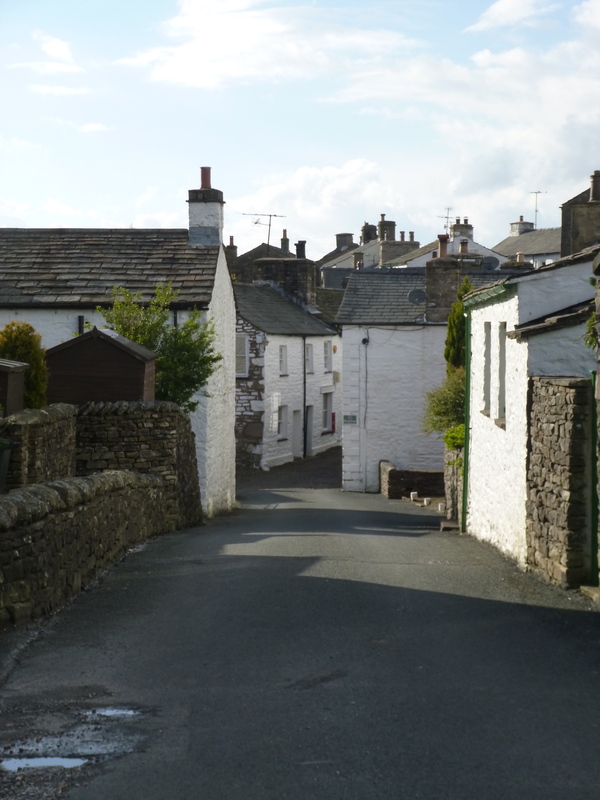 From there it was a steep drop into Settle for lunch, a quite lovely market town. 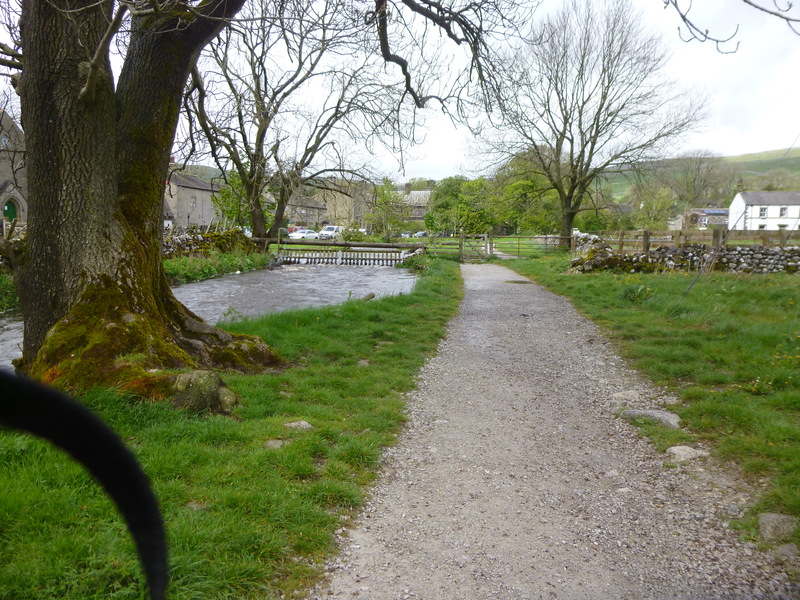 I had only 4 or 5 km to walk now to my next stop, the campsite at Little Stainforth. I passed under the railway and onto the Ribble Way to follow the River Ribble. The path rose and fell in turn, giving fine views to the east and the south. Garlic and bluebells were great abundance along the river, both flowering spectacularly with the garlic lending its delicate scent to the air. The river walk made a fine contrast to the day and it was gentle easy walking with a fair number of dog walkers out on it. 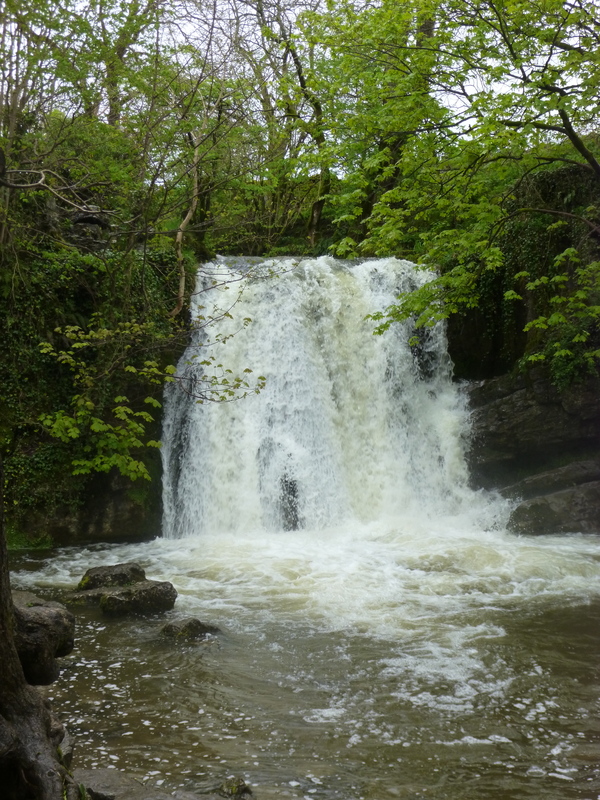 The falls at Stainforth Force made an enjoyable end to a fine day. While not the biggest falls you will ever see, the water had carved a deep impressive channel through the rock. I lingered a while to enjoy them, before making my way round into the campsite to pitch for the night. Quite simply a fantastic days walking. 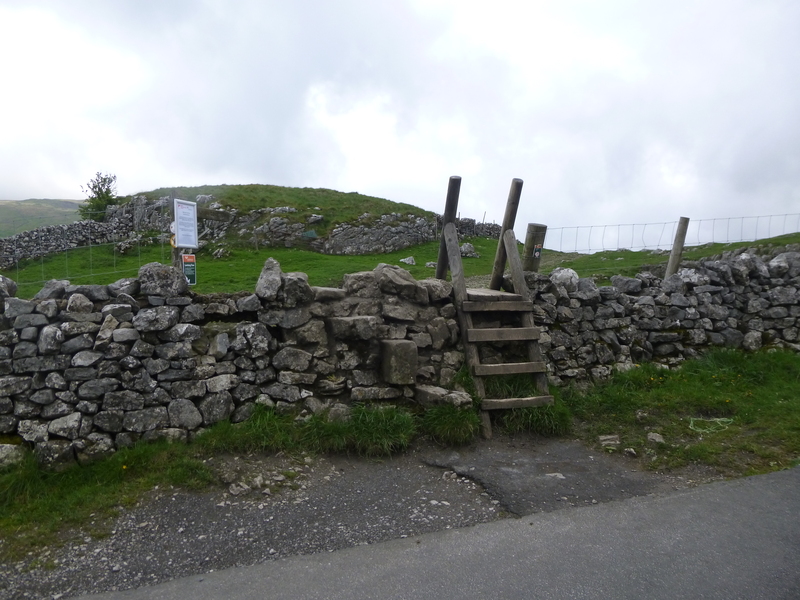 Spectacular limestone pavement and cliffs, crags and caves, not to mention the fine wide open views and relatively easy walking. 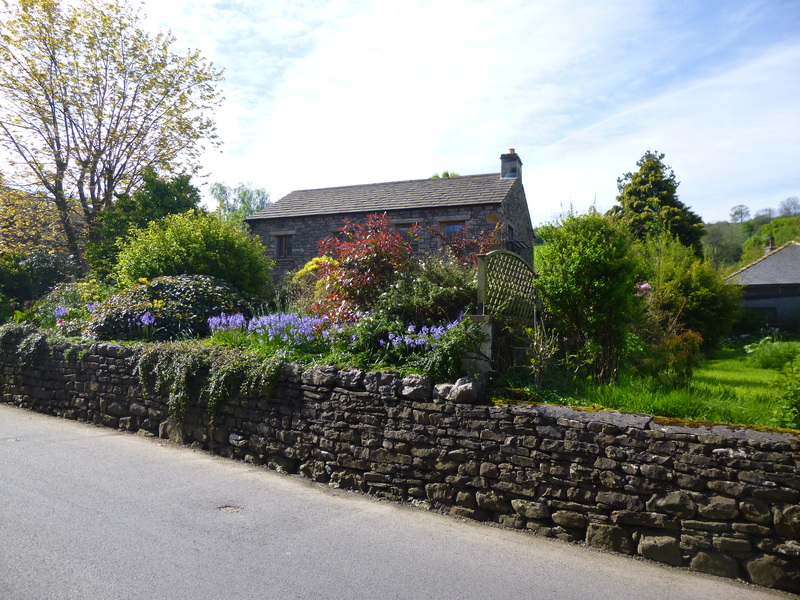 Settle is a lovely place to stop, either as a stopover or even just a lunch stop. Finished off with a lovely river walk, which at this time of year was set off nicely by the flowering garlic and carpets of bluebells. 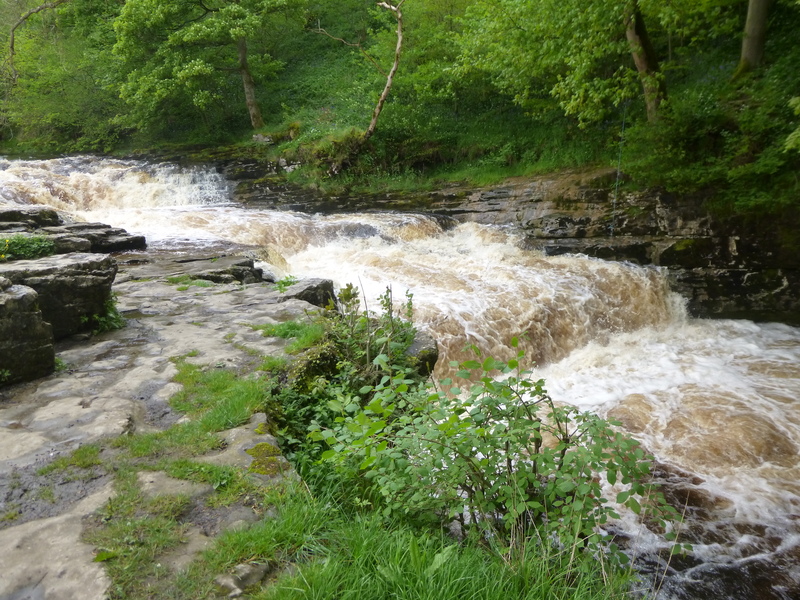 Stainforth Force was just the perfect end to the day which, for the most part, had stayed mercifully dry! 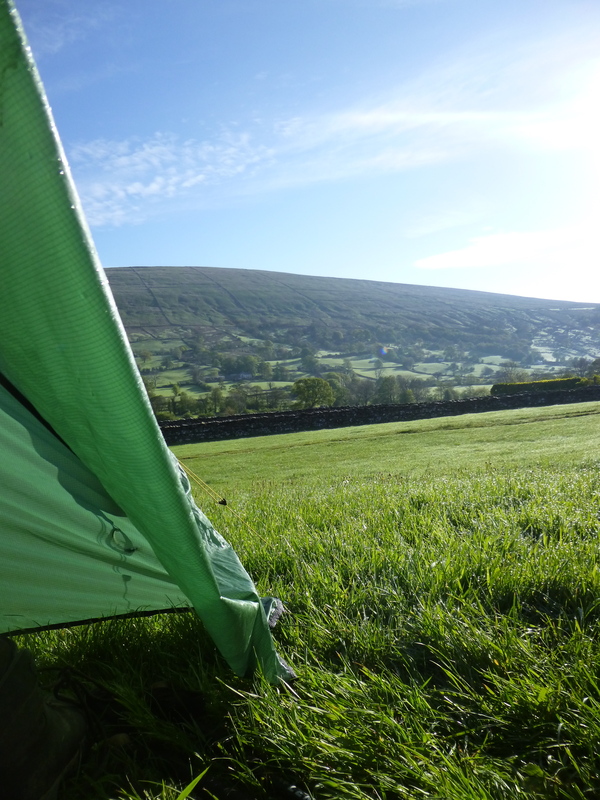 Once again it had rained overnight and I awoke at around 5 with the pattering sound on the tent. It was a shortish day, so I took my time and even had a lie in till around 7 at which point the rain stopped. I packed down and made breakfast, once again amused by the disorganised exploits of the DoE group who were also busy preparing themselves for their day ahead (I was like that once – it does take a while to learn a routine). I even surrendered my spare emergency matches to a couple of kids who had used all theirs up trying to light their trangia stove. They even managed to use the whole pack! I went for a shower and on the way back spent a few moments watching a rather ambitious sparrow trying to pick up what looked like a large goose feather and fly with it (rather unsuccessfully). In the meantime the sun had come out and the tent dried off nicely, and by the time I left the sunglasses were on and the DoE group still breaking camp. The first step was to get back on to the route (how on earth did I miss the very obvious large mansion the day before? 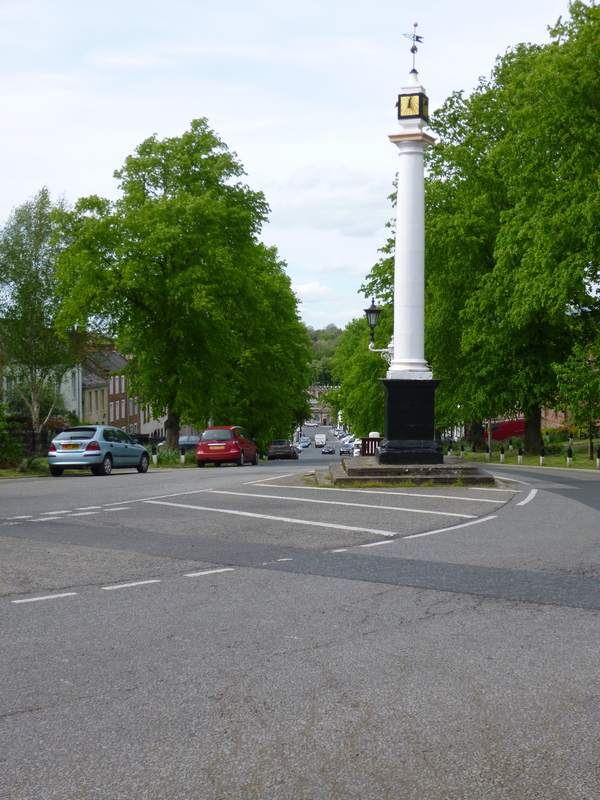 ), retracing my steps the mile or so to Flasby , a very small but pretty hamlet. 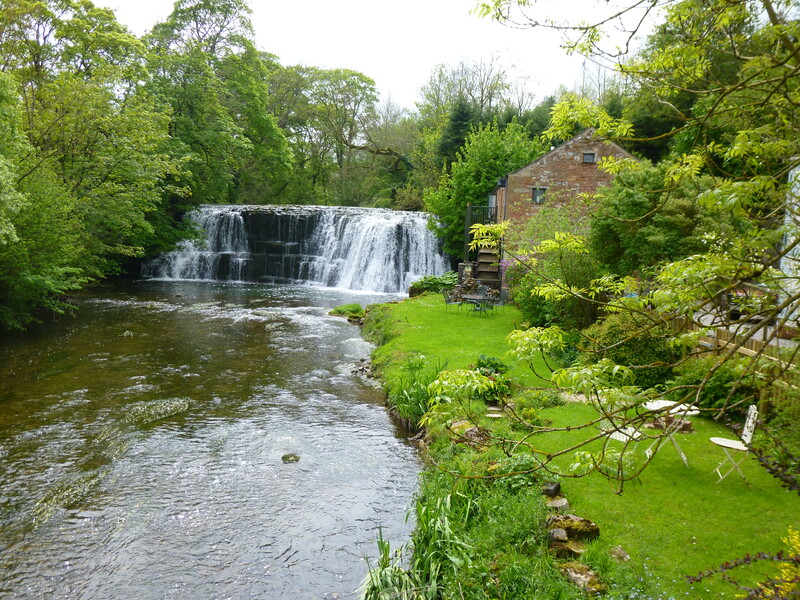 Flasby Beck would be my companion for the next few kilometres, almost until reaching Hetton. 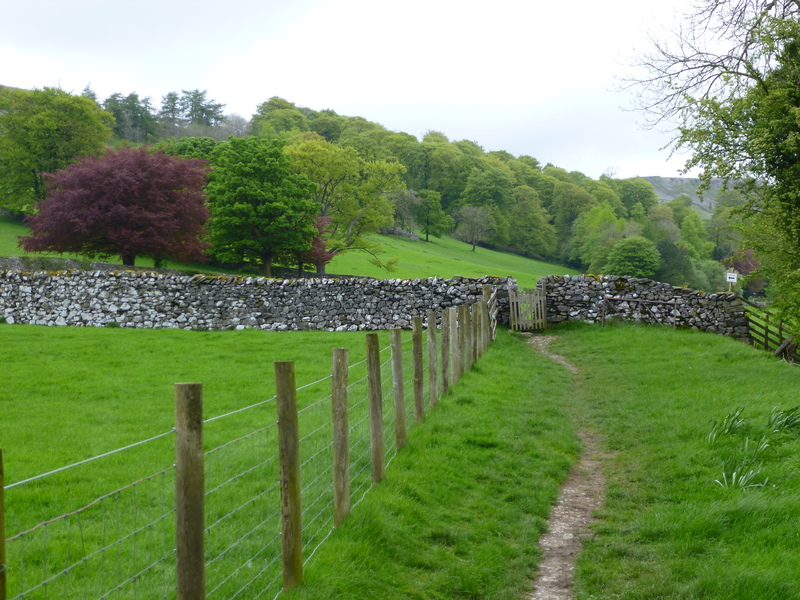 This was delightful walking, with the path in turns down close to the Beck, then high up on the bank in green pasture. At one point I passed through a gate into a field of young bulls, who immediately started following me. Just curiosity and nothing more sinister, but they did follow for quite a distance before losing interest. Slightly more concerning was the buzzard which seemed to be rather upset by my presence, passing over me a little closer than usual. Had the wind not been so strong it is not beyond the realms of possibility that I could have had a large bird of prey attached to my backpack! The sun was out, the walking was serene, it was a bit windy – what could possibly go wrong? Close to Hetton I felt a spot of rain. On turning round it was like a wall of water, a sort of grey wall, was approaching from the south. This would set the tone for the rest of the day. There was nothing for it other than to press on. I had considered stopping at the pub in Hetton, but it was still early and to be quite honest, it looked rather pretentious. A sign outside reading “There is a charge of £8 if customers wish to eat their own food at these tables”, is not a very welcoming sight. I had the impression that if I wanted to go in a full decontamination procedure would have to be implemented. Of more concern was the fact that I was barely 5 miles into the day and I was toiling. Badly. 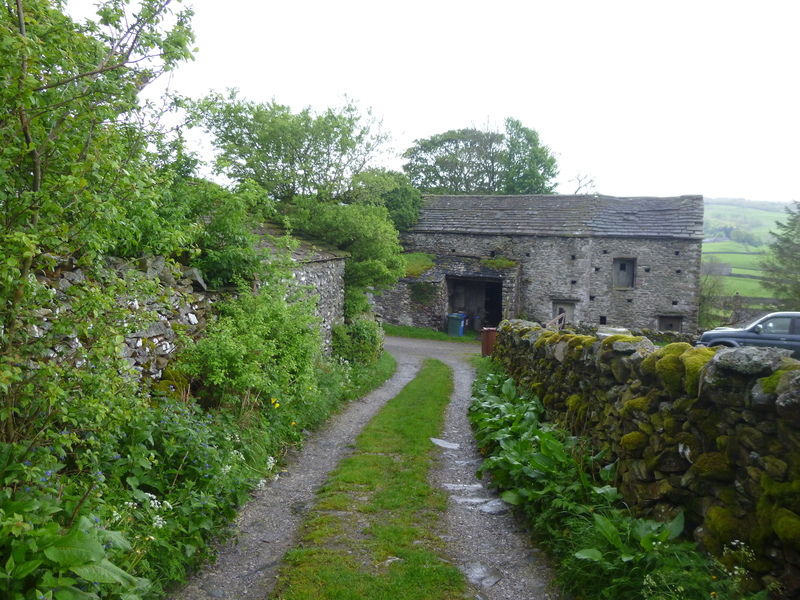 I walked through the village and turned onto Moor Lane bridleway, a long slog in the rain that was reminiscent of the previous day along the Roman Road. The views back to Hetton were fine on the few occasions that I stopped to rest for a moment. 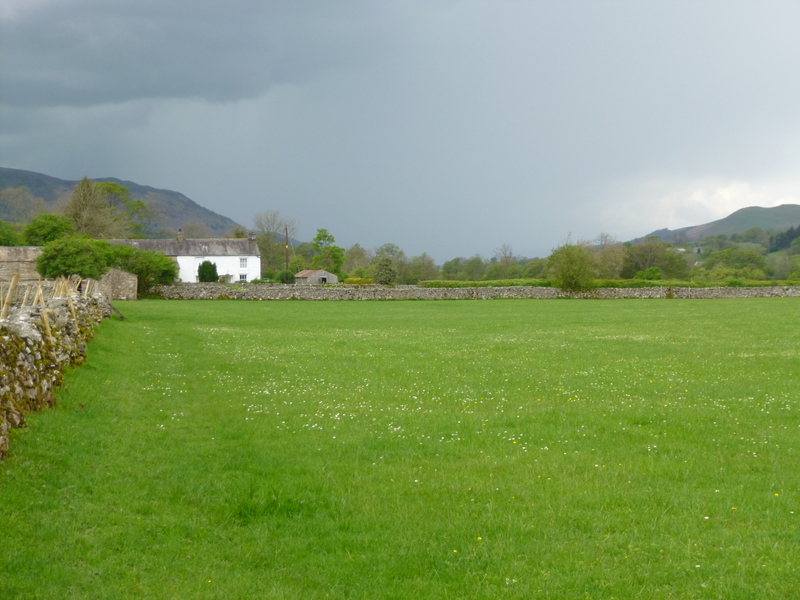 The bridleway was a walled path here and full of sheep. For a while I felt like a shepherd! At the end of the walls the path burst out above Winterburn Reservoir. 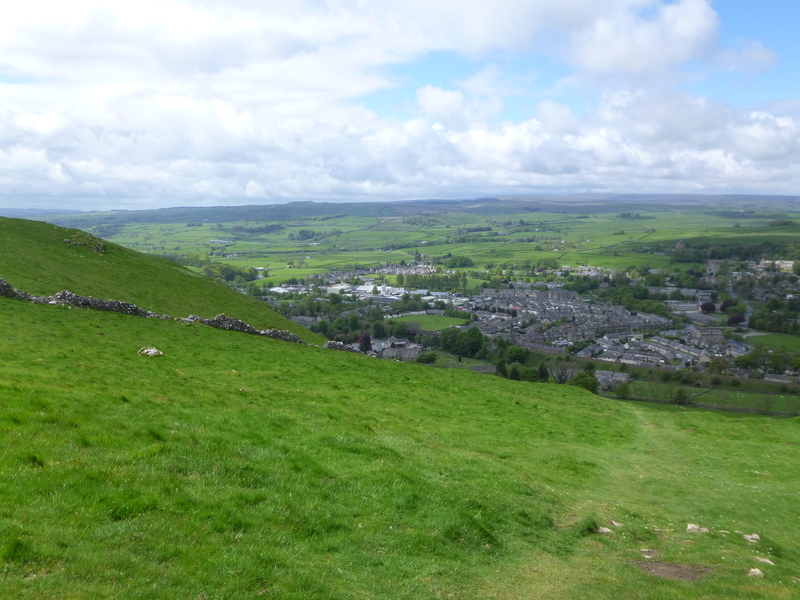 A couple caught me up here – finally some other people walking the Dales High Way. We walked together for a short while, talking about various long distance paths in the UK. On an aside, the DoE group had appeared down by the shore of the reservoir (identified by their large map cases and badly packed rucksacks), wandering about like lost sheep and generally looking…well…lost. Winterburn Reservoir. It was wet. It was another long and steady slog up to Weets Top with the rain now passing over in waves. There were a lot of fell runners here, taking part in what looked like an organised event. Nice day for it. In fine weather it would have been stunning here, but it was miserable and I press on. I did manage to find a fairly sheltered spot to have a quick bite to eat though. Even amongst all this, what was obvious was the abrupt change in geology on passing over Weets Top. 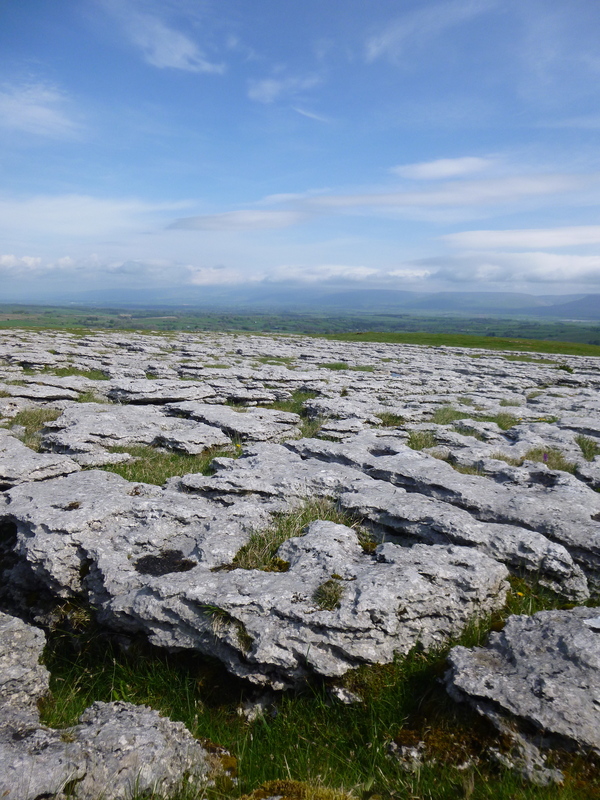 There was spectacular Limestone Pavement everywhere, just magnificent to look at. 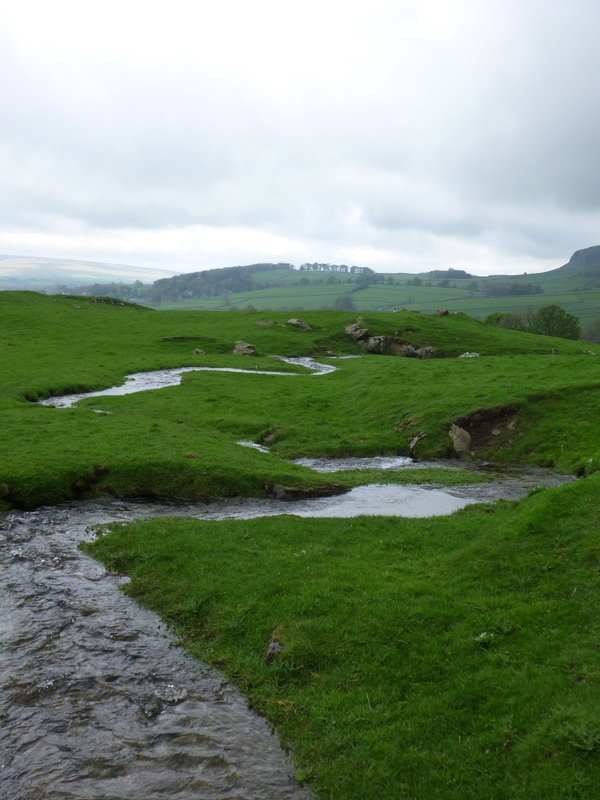 As I walked down the road towards Gordale Scar the hose was turned on, turning it into a river. Remember the plans I had talked about? 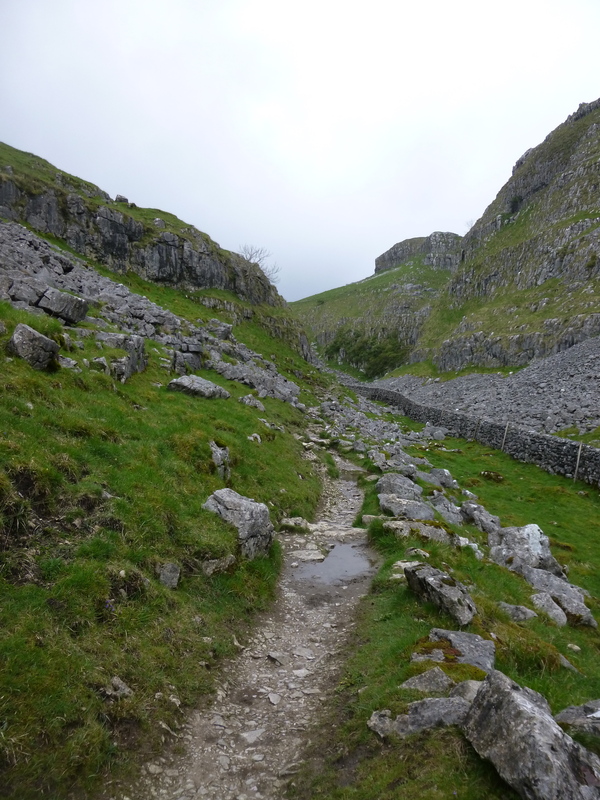 Well, I had planned to walk into the Scar, but, to be perfectly frank, I was shattered, soaking, miserable and just looking forward to getting into the YHA at Malham. I carried on. 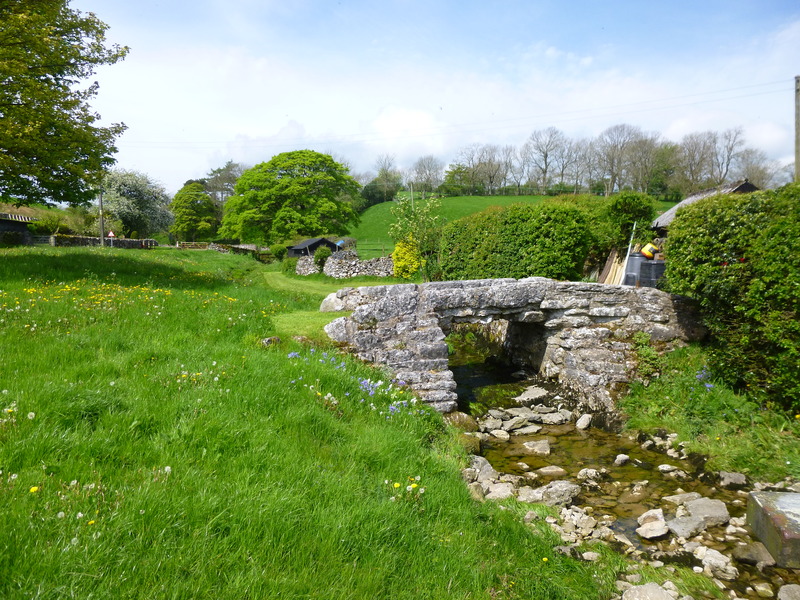 The campsite at Gordale House did look fantastic, (although the water in the beck was looking uncomfortably high), but even better was the tea wagon at the bottom of the hill. It was open and I gratefully scoffed a bacon roll and a coffee. It was here I left the official route to make my way into Malham, via Janet’s Foss waterfall. With all the rain it had a spectacular flow over it. 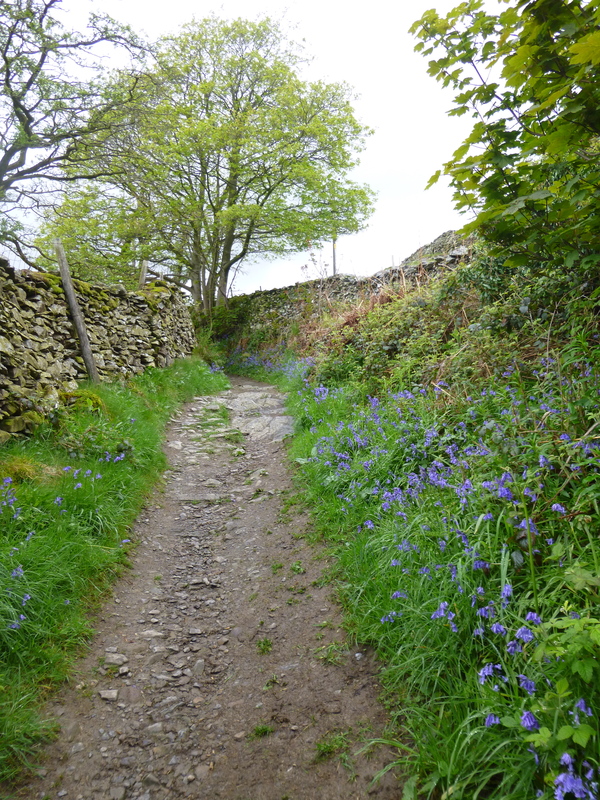 This was now a lovely walk through the woods alongside Gordale Beck and it was busy with day walkers from Malham. For a while the sun even came out, and I even nodded off for a while on a stone bench while the rain held off. 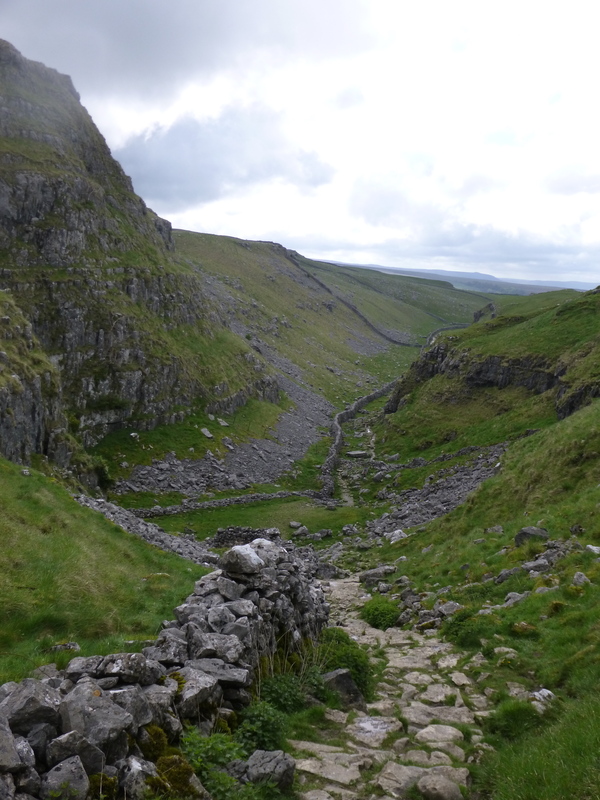 It wasn’t long before I reached the Pennine Way and the last short stretch into Malham. It was only three o’clock when I arrived, and the reception to the hostel wasn’t open. I was too knackered for anything else so went and sat in their lounge with my feet up until opening time. A sub 10 mile day and I struggled badly.